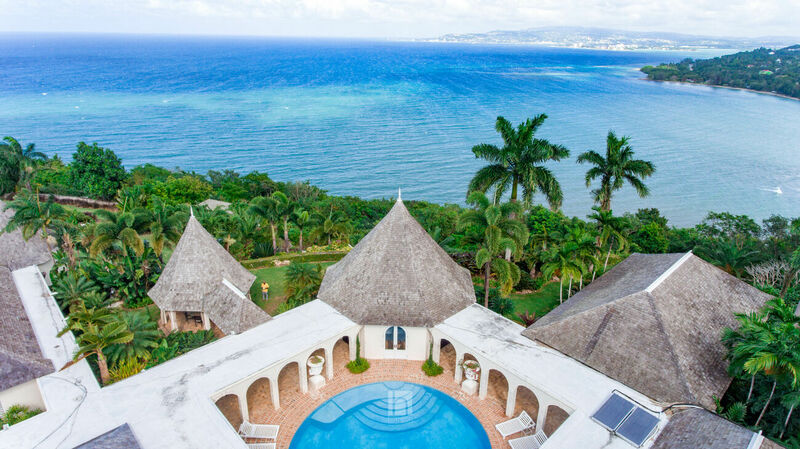 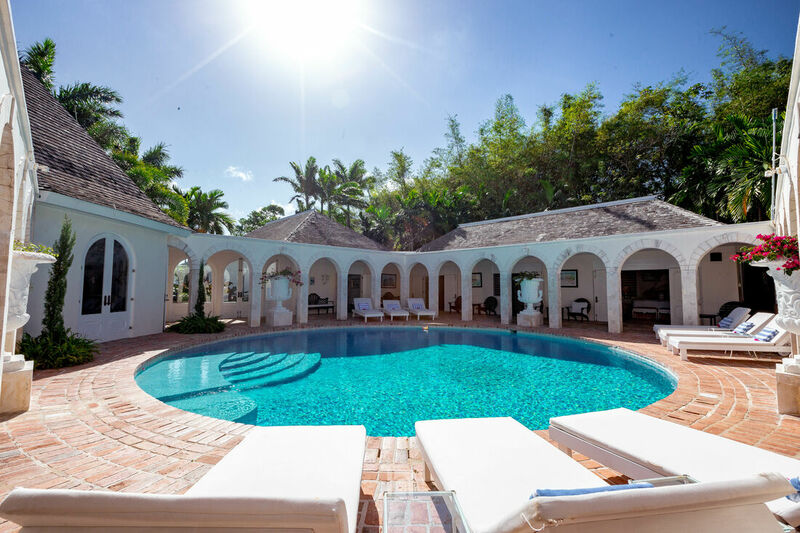 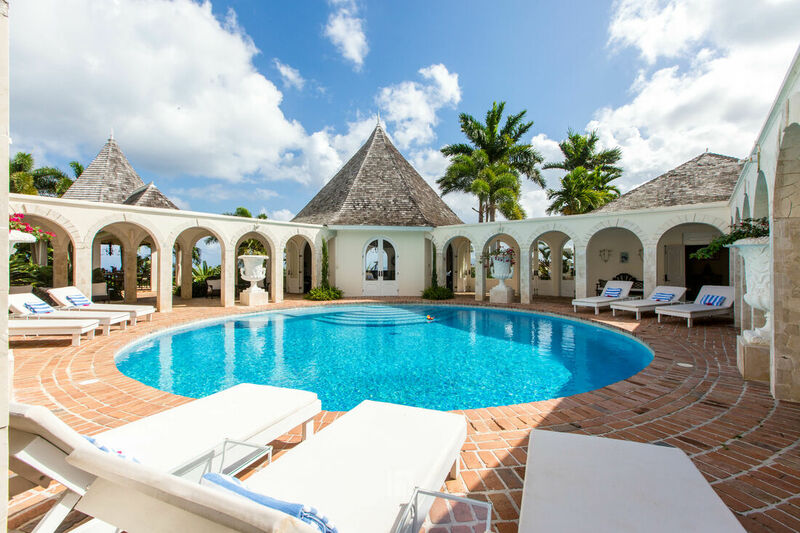 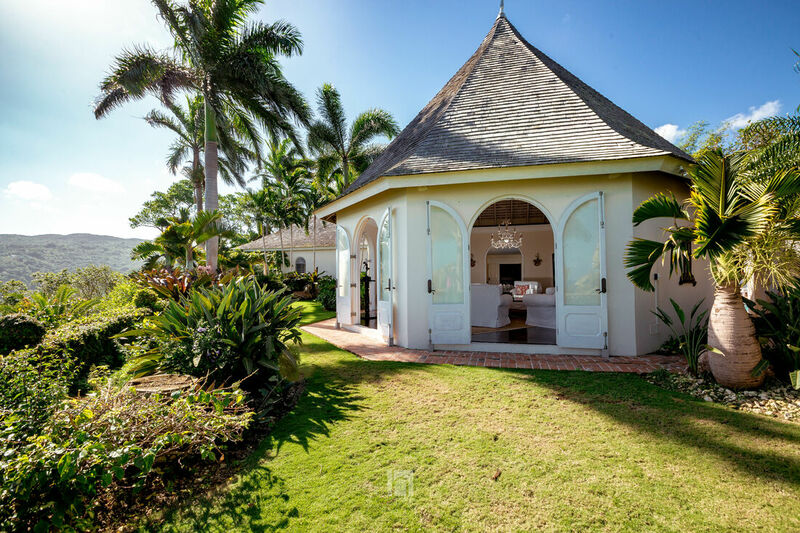 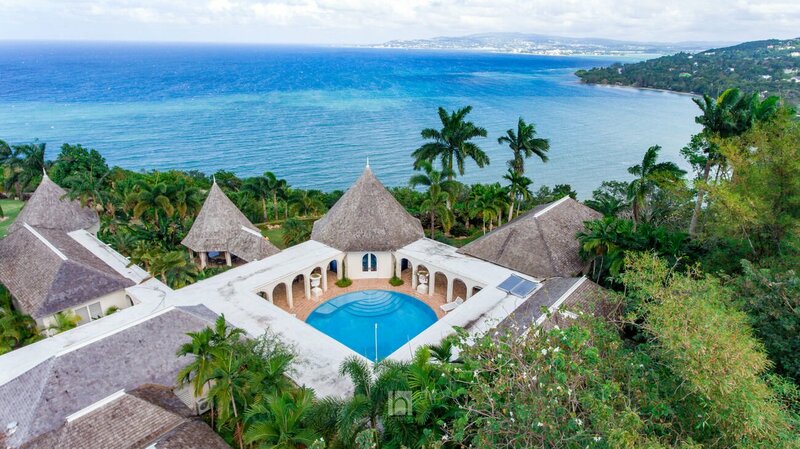 Bambu villa in Jamaica is located at Tamarind Hill which is approximately nine miles west of Montego Bay International Airport. 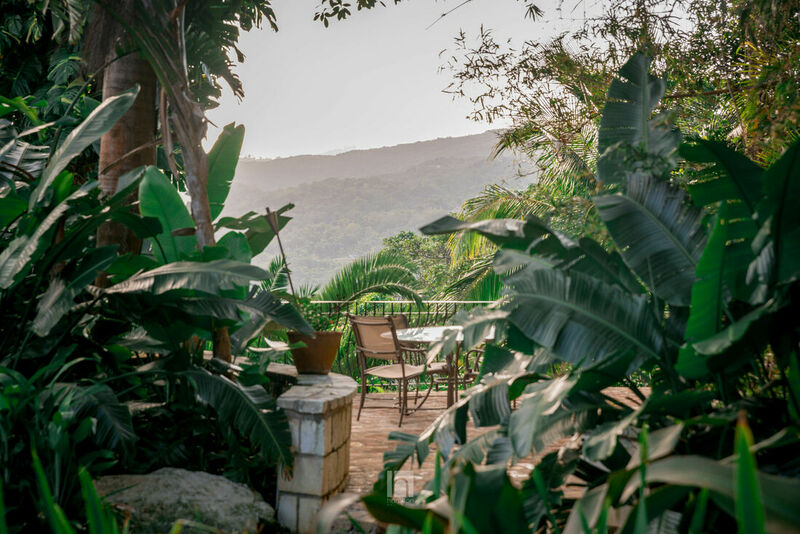 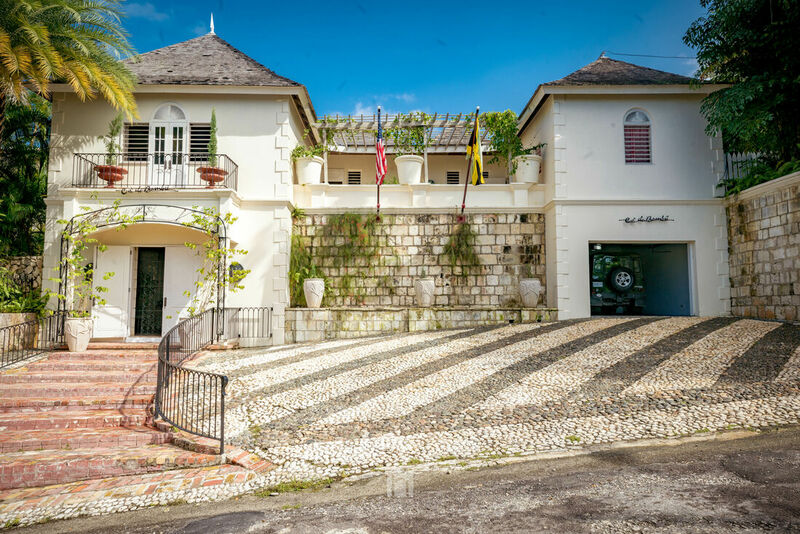 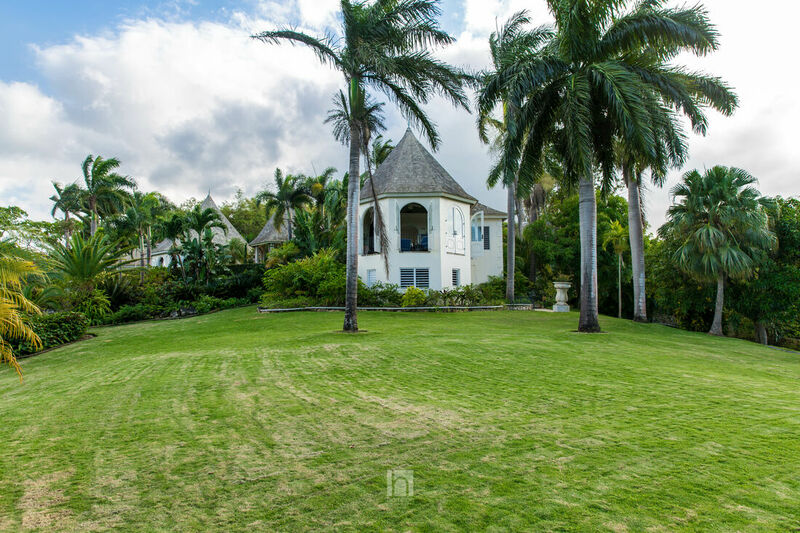 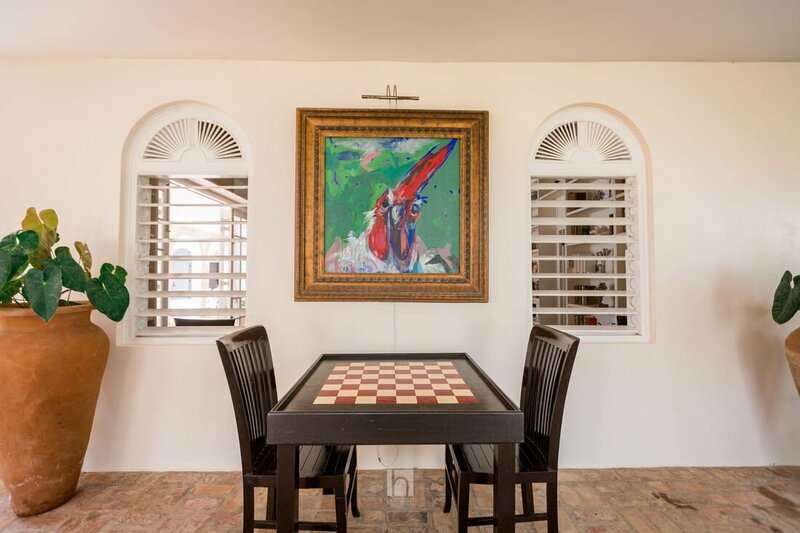 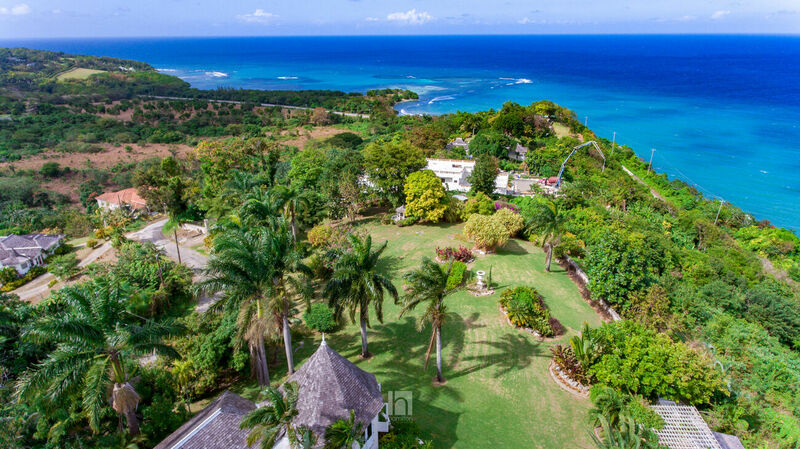 The property is conveniently located only a few minutes drive from Round Hill, Jamaica’s most elegant hotel and five miles from the Tryall Club with its internationally acclaimed 18 hole championship golf course and other facilities. 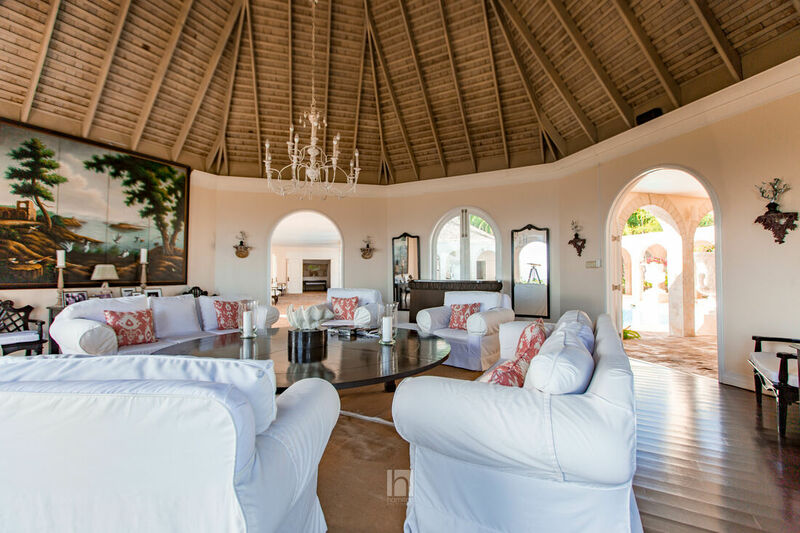 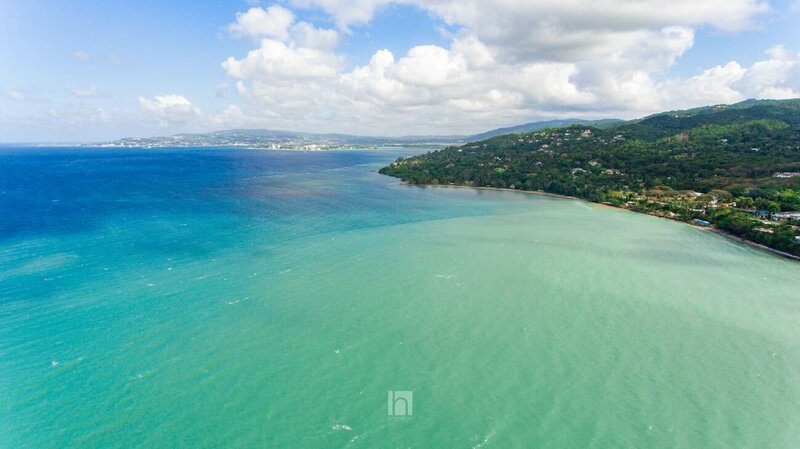 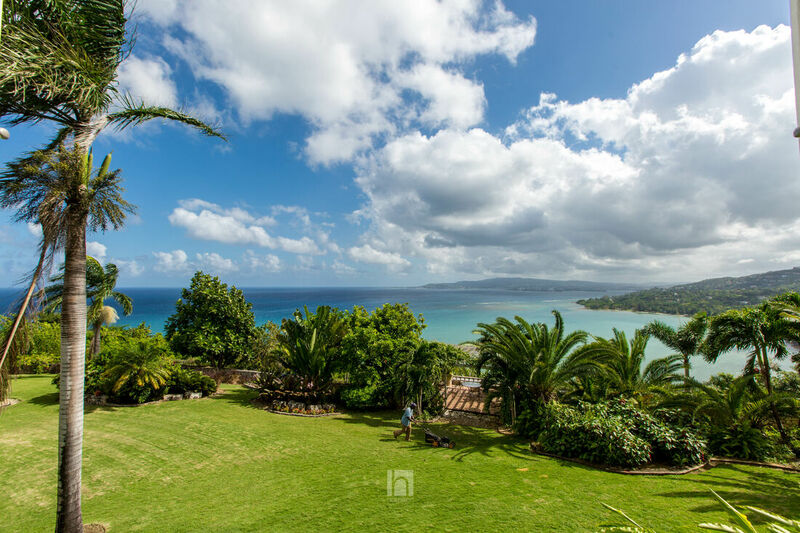 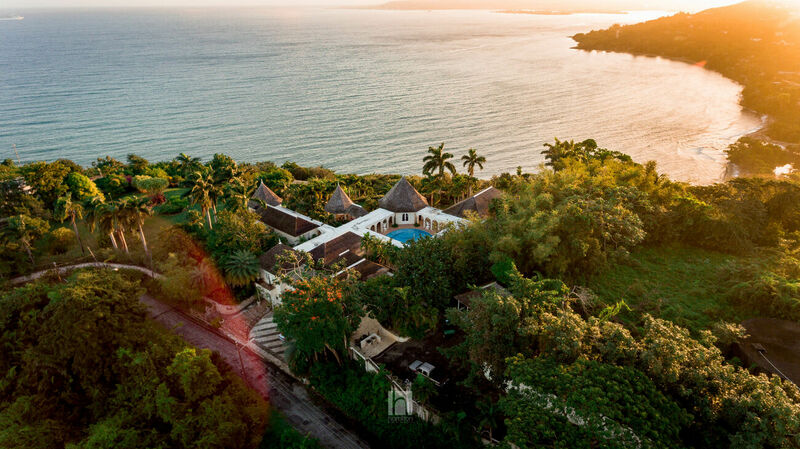 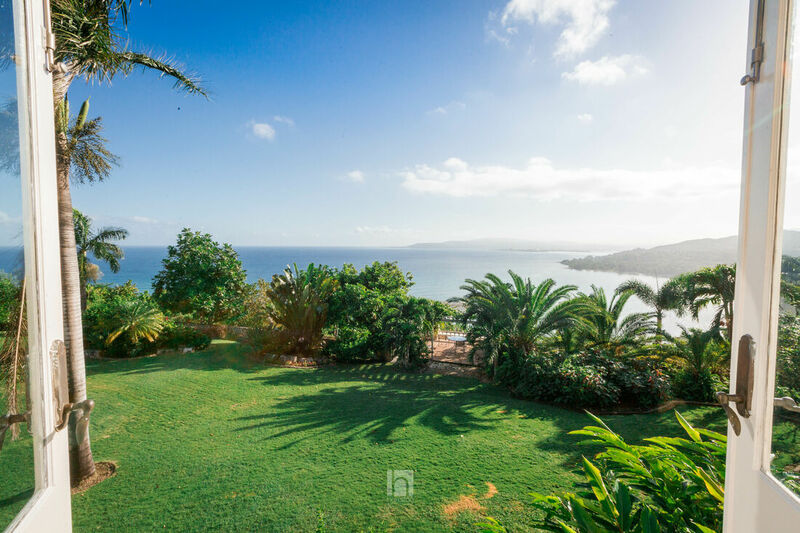 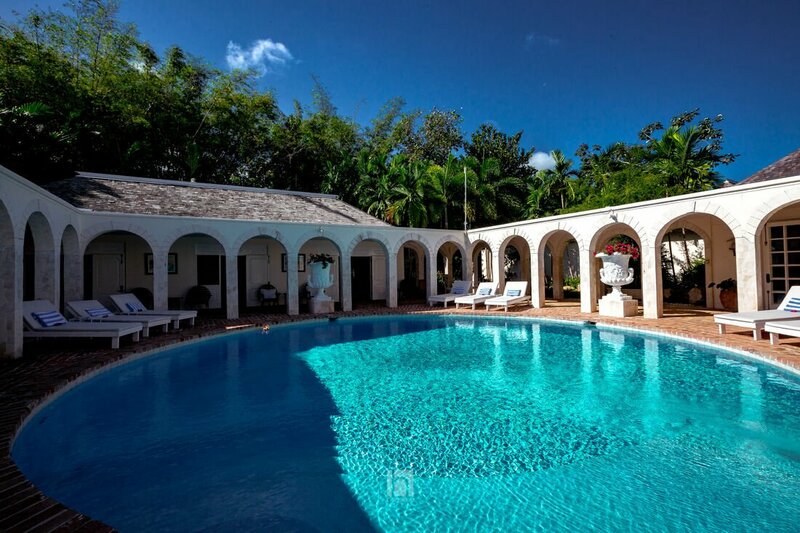 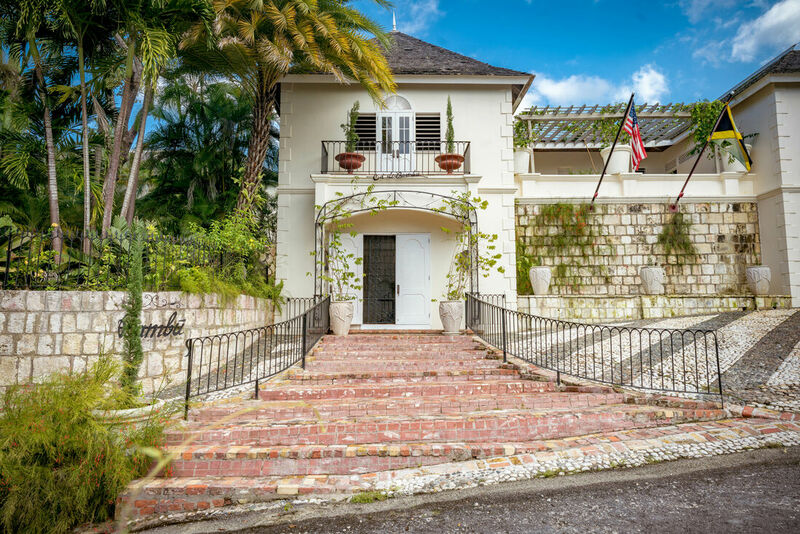 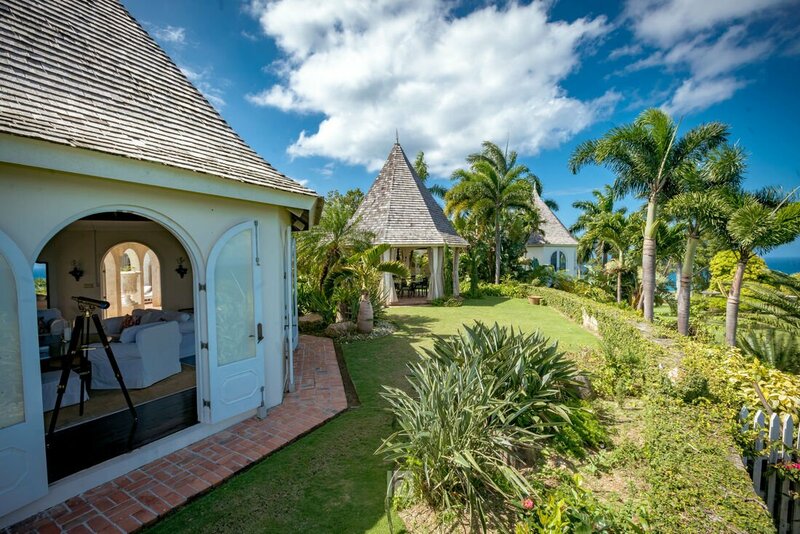 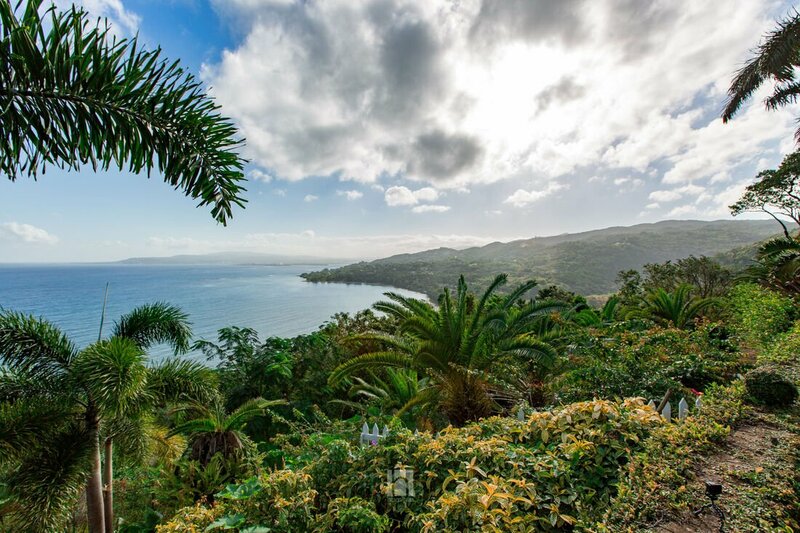 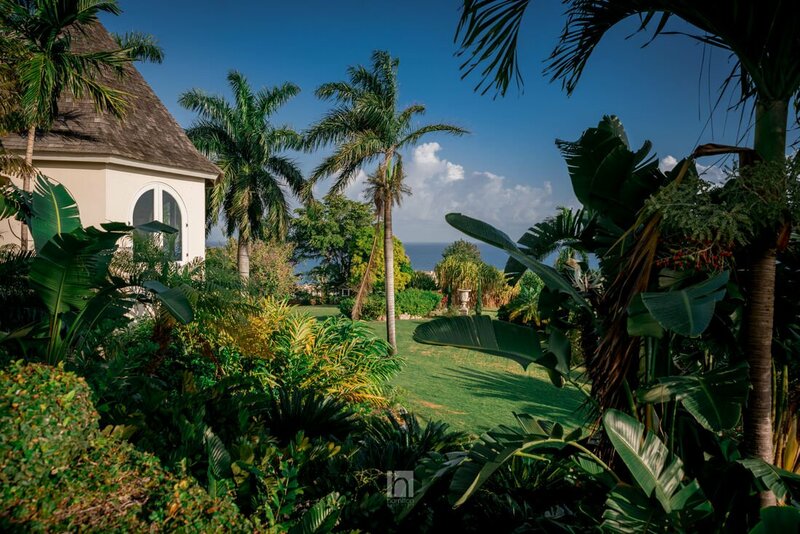 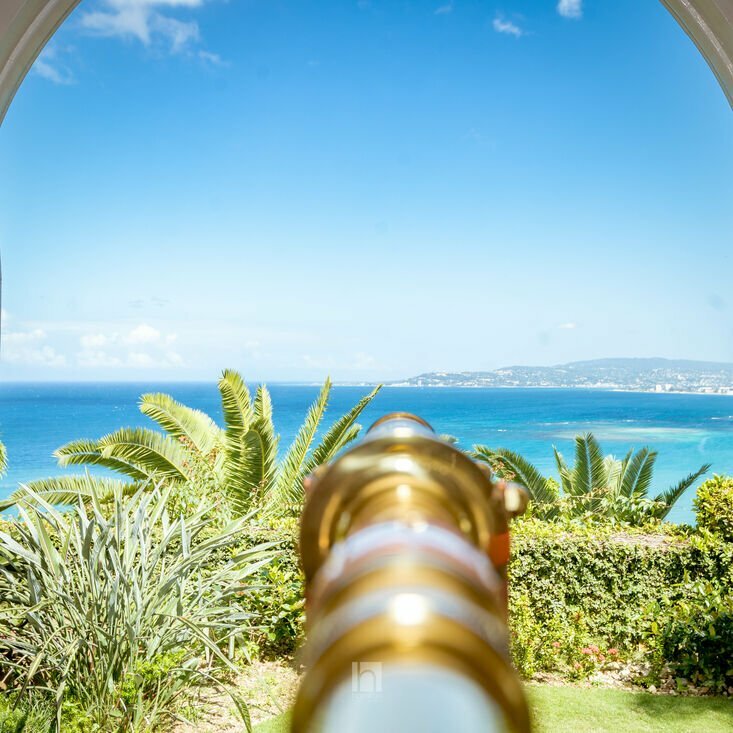 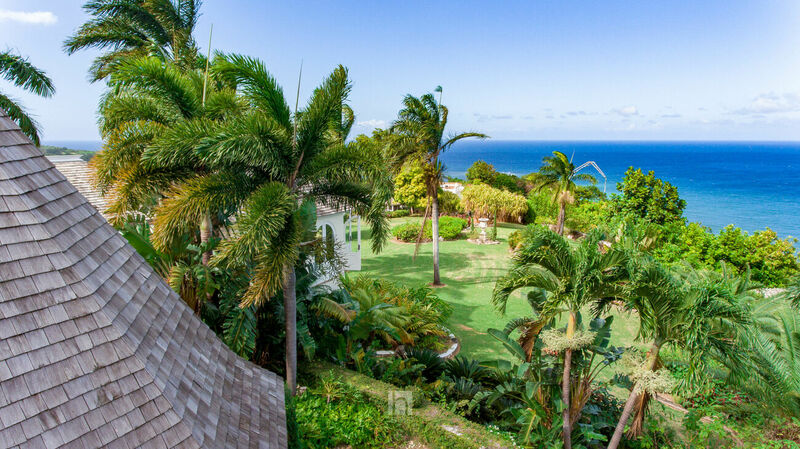 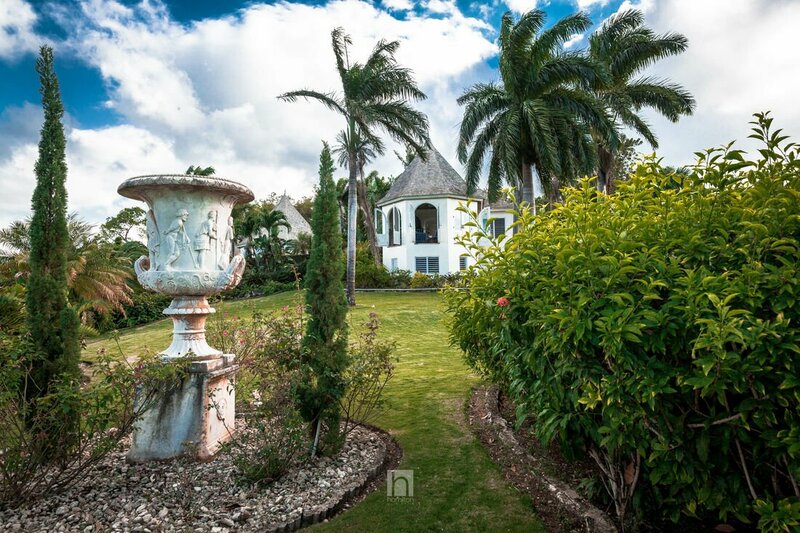 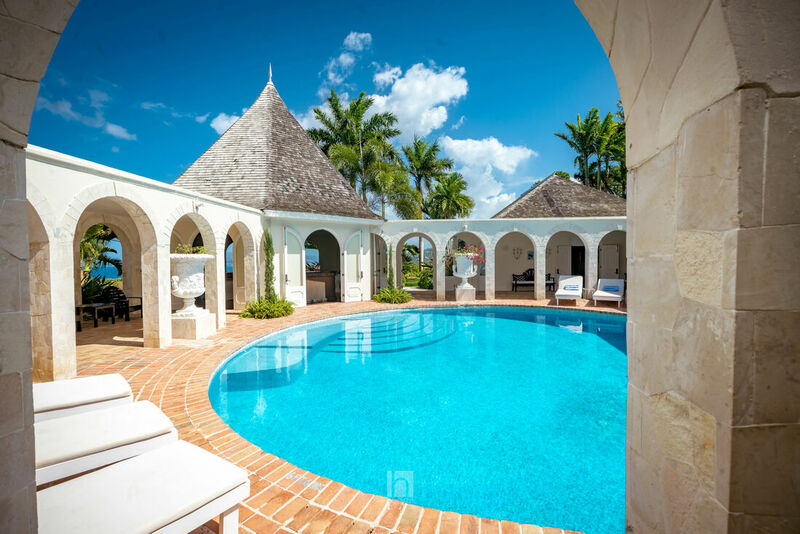 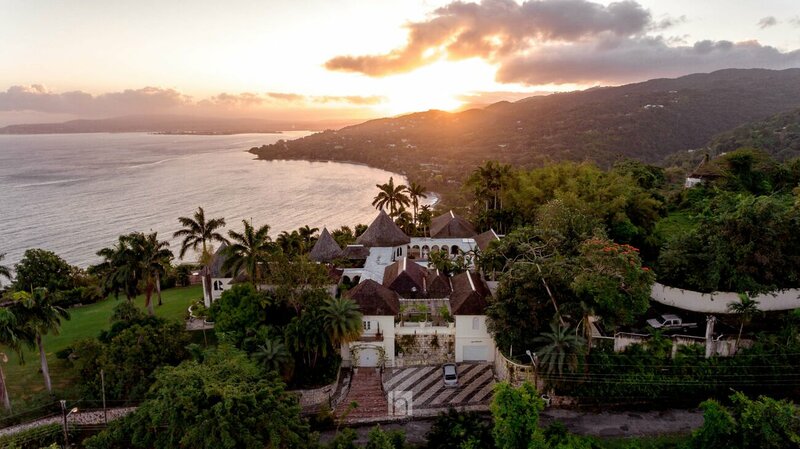 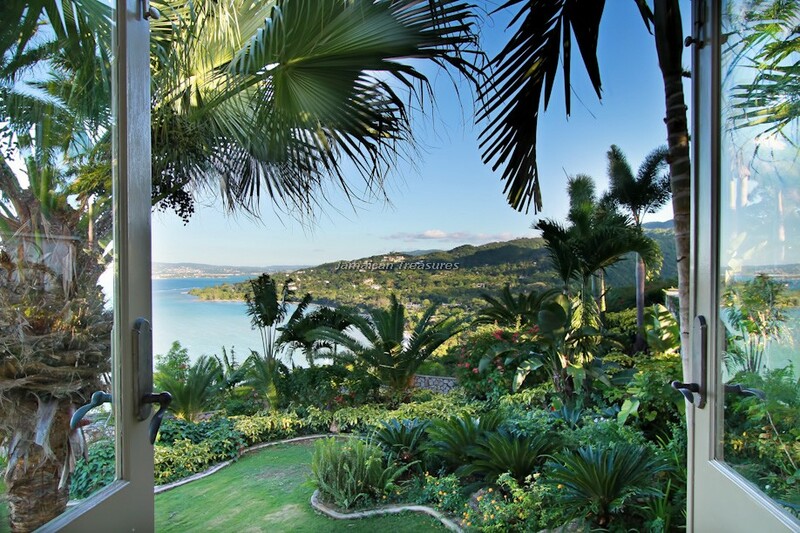 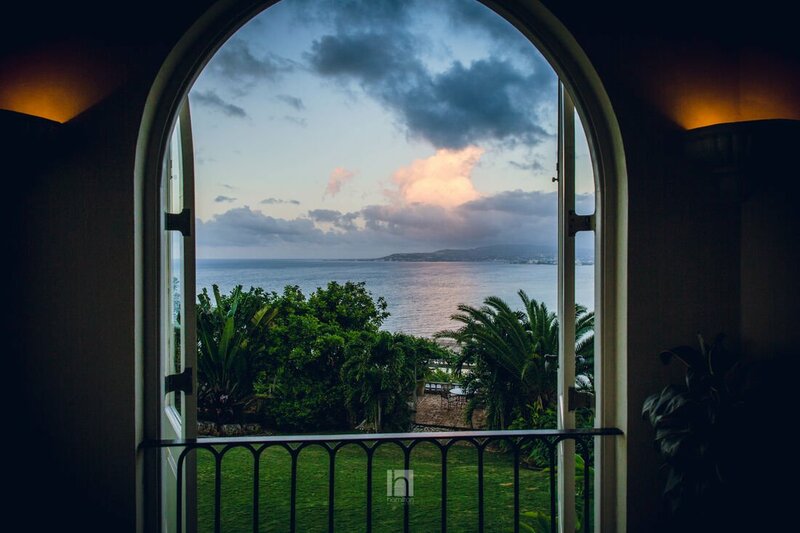 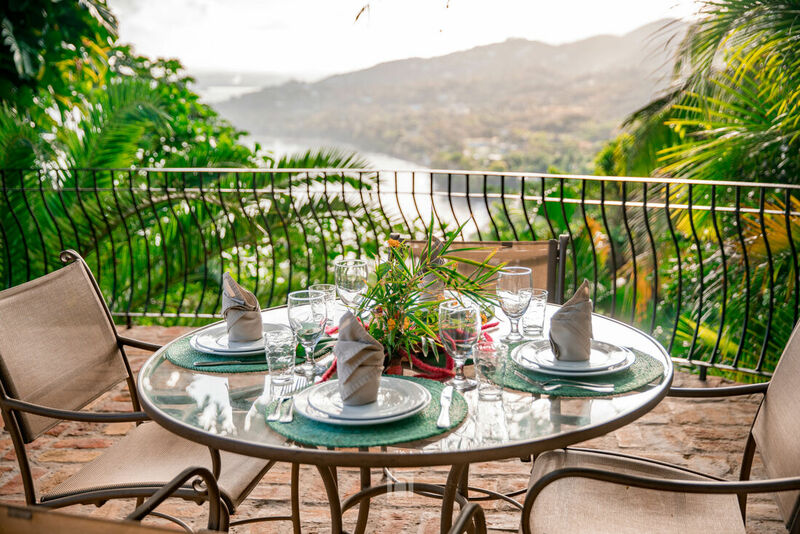 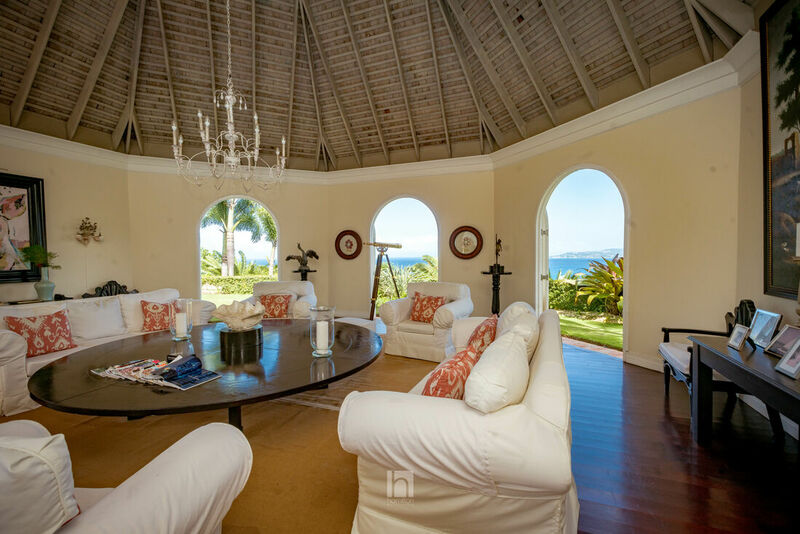 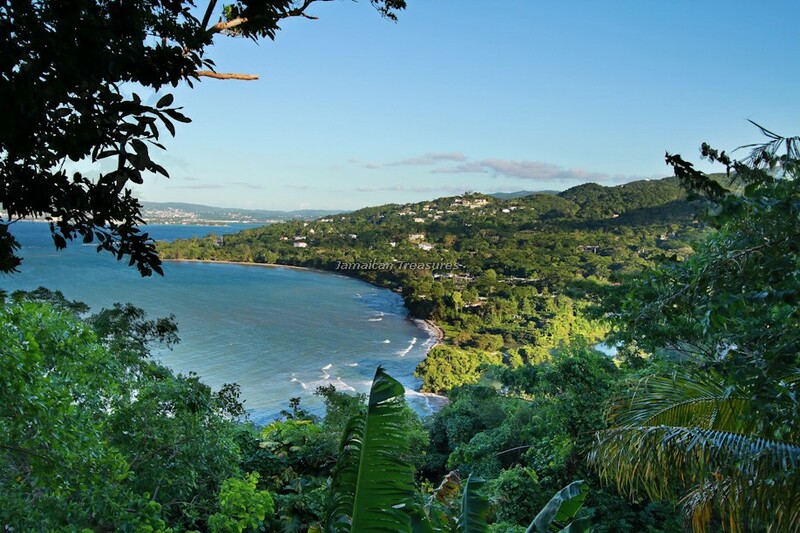 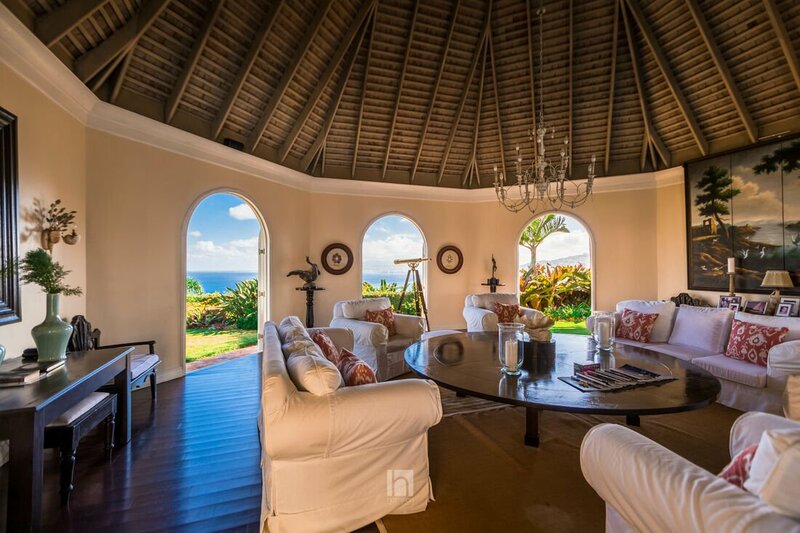 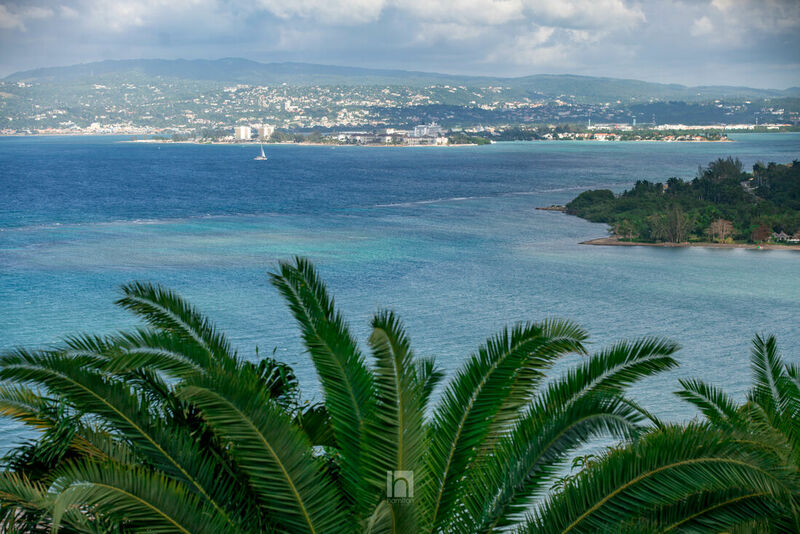 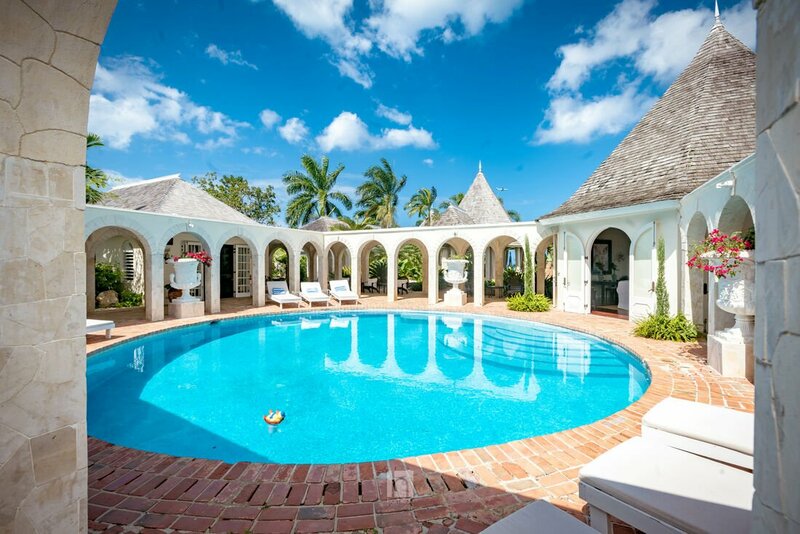 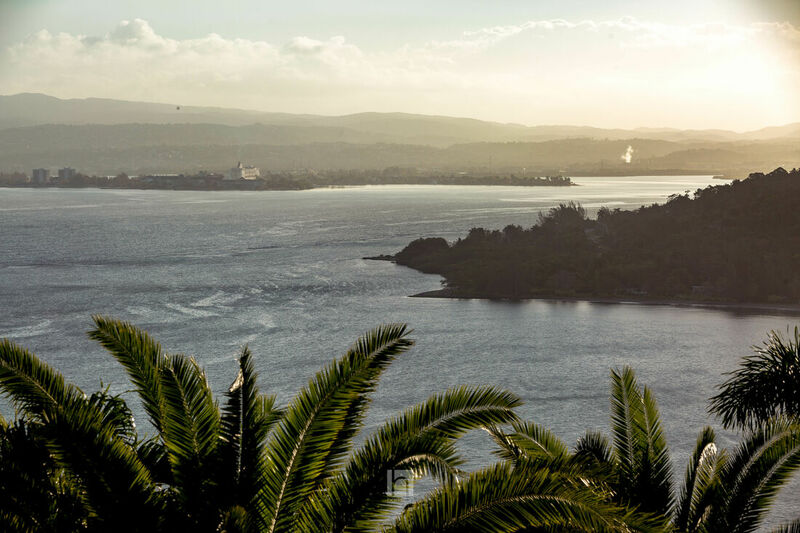 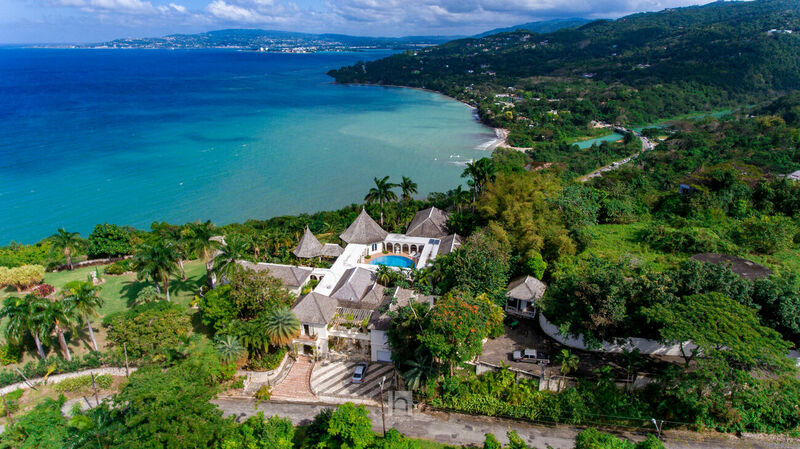 This hill top estate of over seven acres is superbly sited to enjoy magnificent views over the Caribbean Sea and along the coast line to Montego Bay. 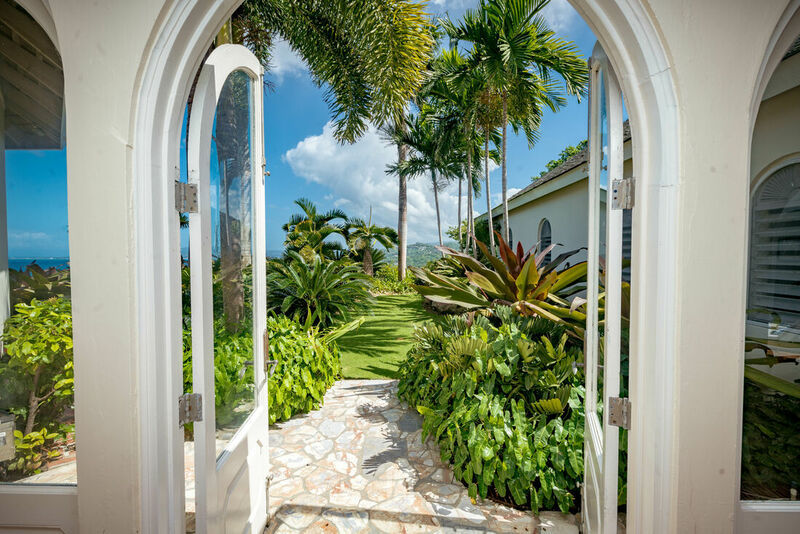 Bambu is set in beautifully landscaped grounds with well manicured lawns bordered by lush tropical flora containing a wide variety of plants including the rare Japanese lantern hibiscus, Giant White Birds of Paradise, agapanthus, West Indian lilies, Giant Crinum lilies and ground planted orchids. 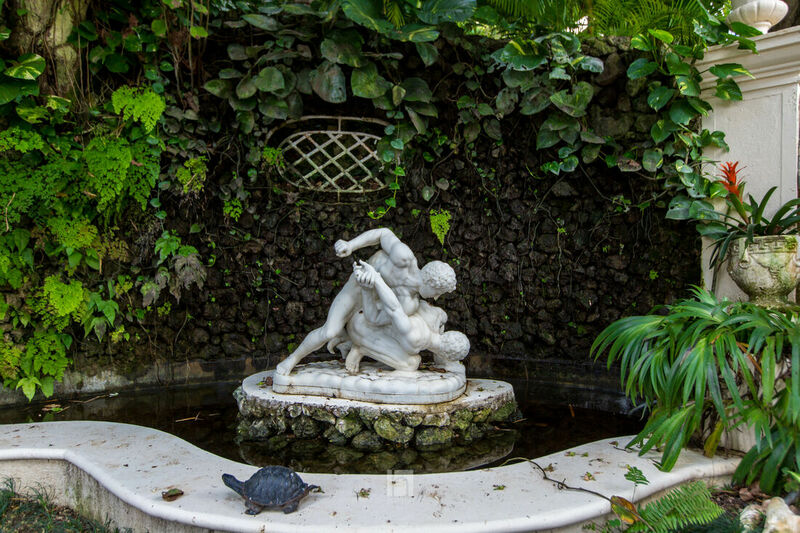 There are wild white begonias, three varieties of heliconia, bougainvilleas, rare Bromeliads and Epiphytes with an interesting collection of Palm trees including Fox Tail Palms, Chinese Fan Palms, Lady Palms as well as Royal Palms and Coconut Palms together with white and lavender orchid trees and a bamboo garden. 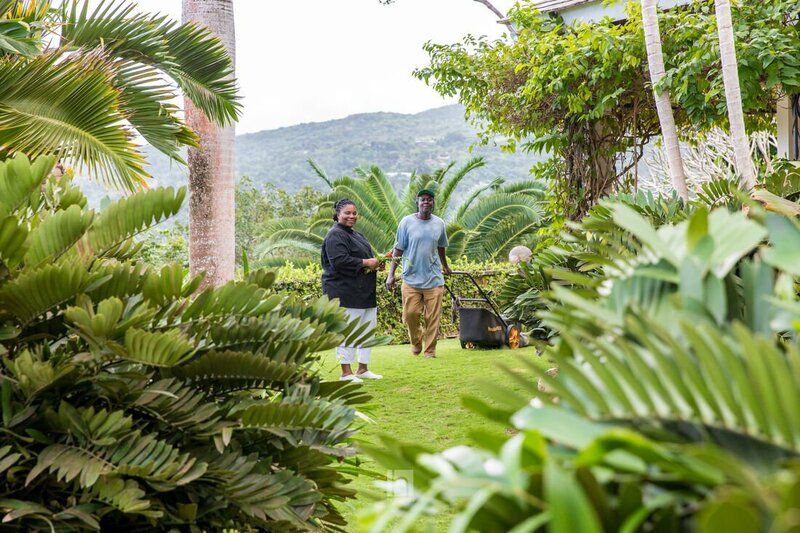 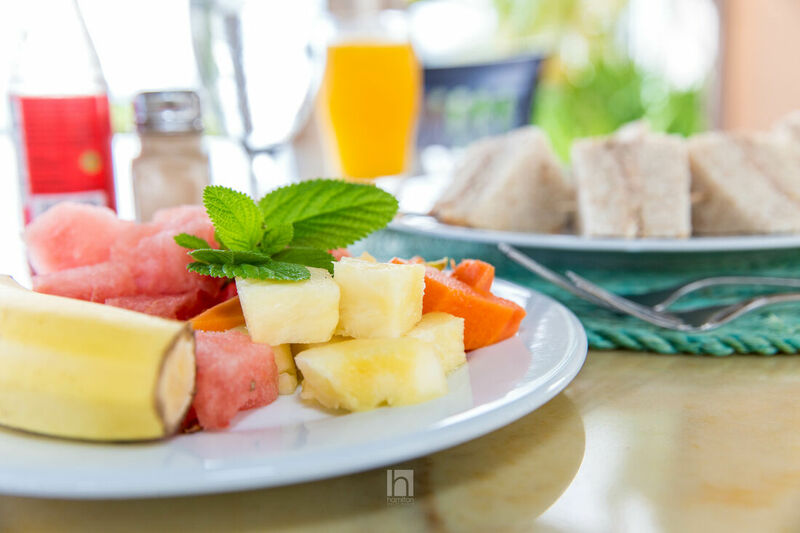 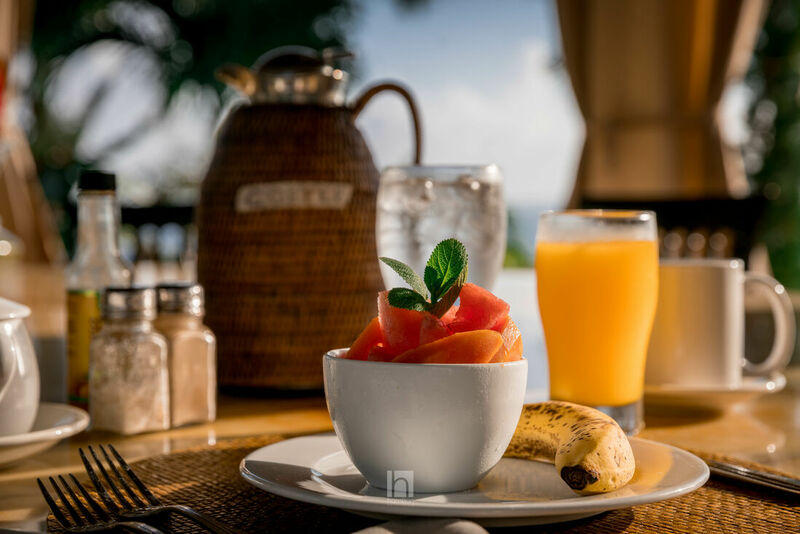 The grounds are well fruited with oranges, limes, guava, avocado, papaya, ackee, honey bananas and three varieties of mango. 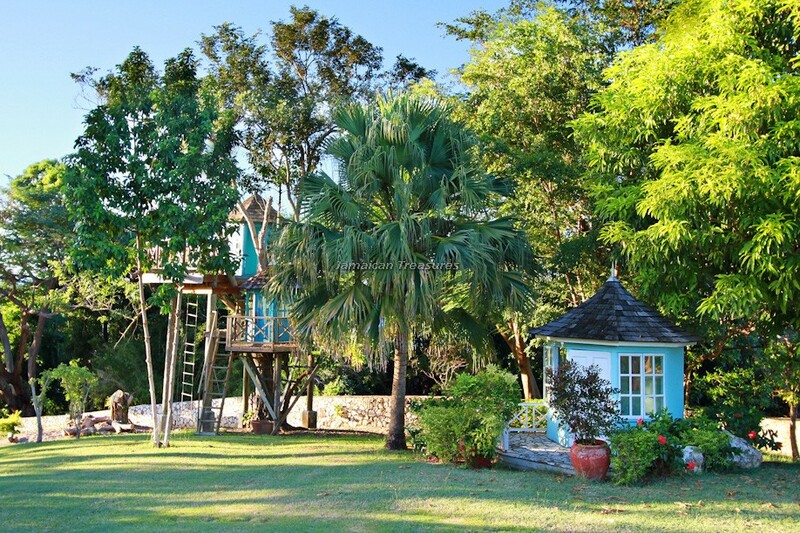 There are Poinciana trees surrounding the house on the north and east sides and tucked away in this lovely garden are a tree house for little boys and a play house for little girls. 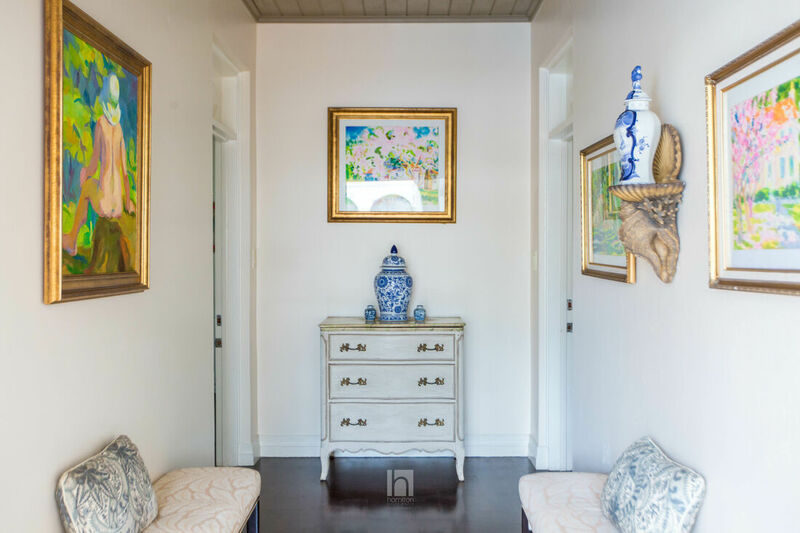 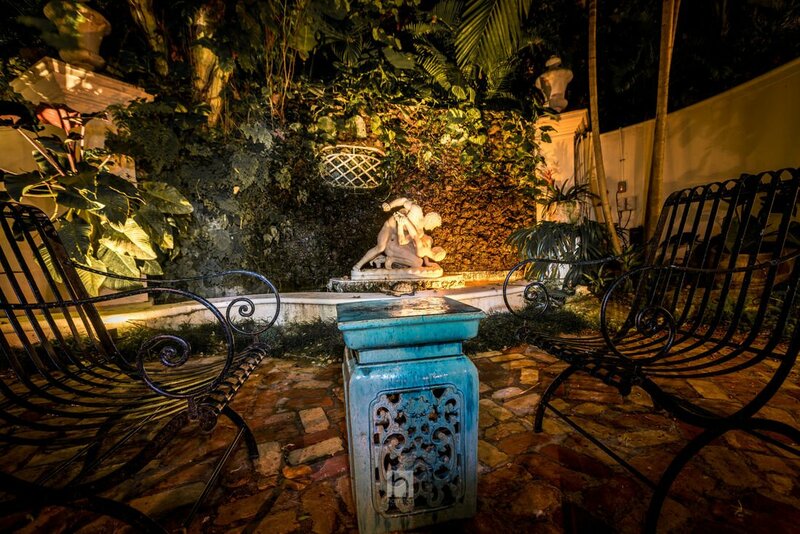 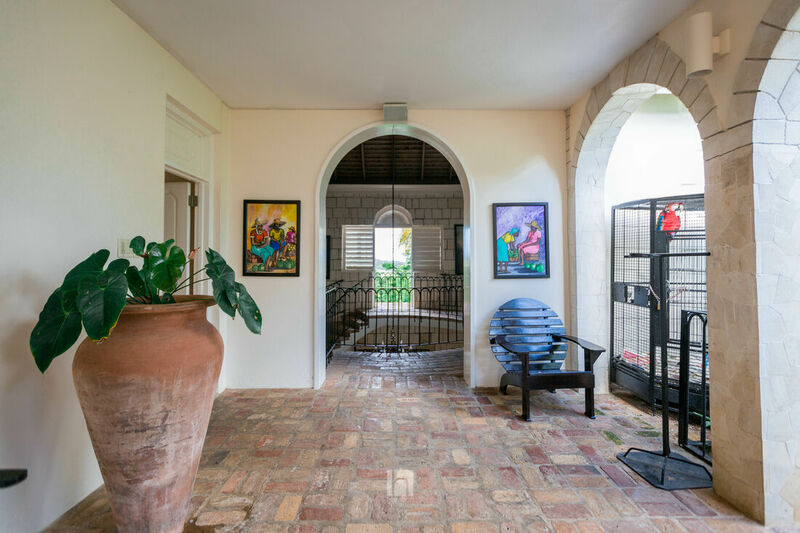 The house is entered through a wrought iron gate and double mahogany doors in to an impressive double level entry hall 40 feet high with antique brick floors and limestone walls. 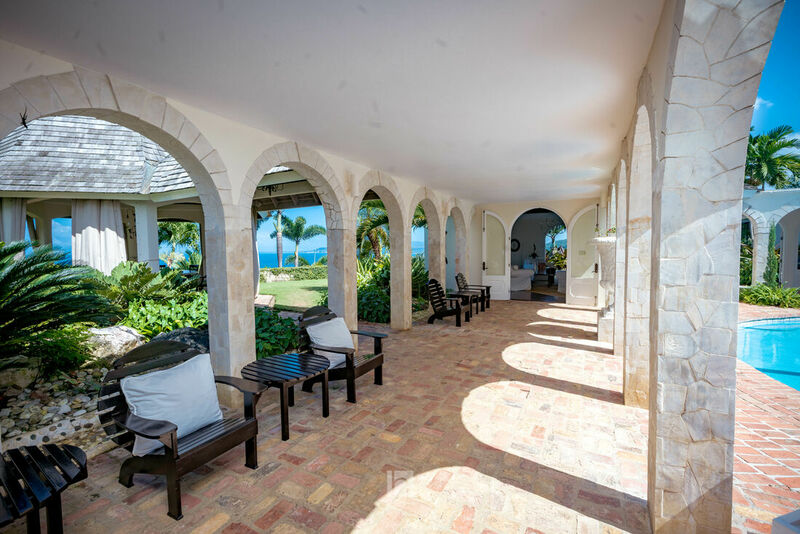 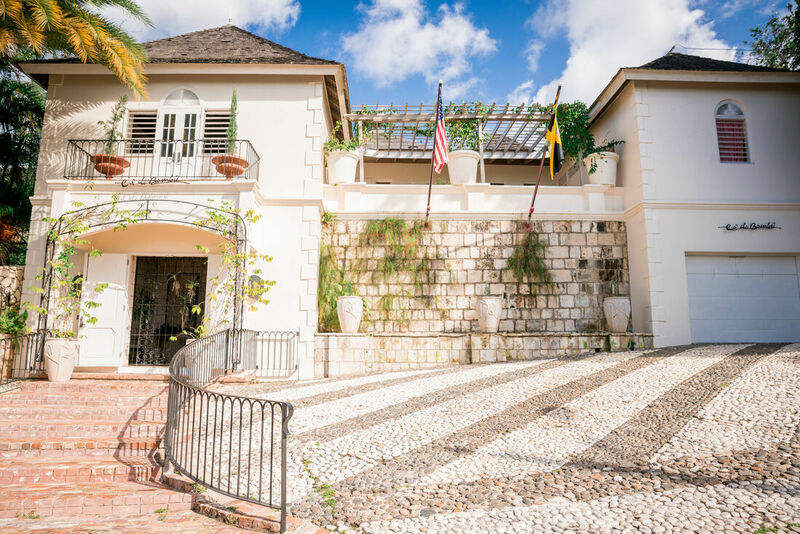 A semi circular staircase climbs to the main level of the house where on the west side there is a balcony with views of the Caribbean Sea and Round Hill and on the east side a large arched opening gives access to the main parts of the house through a covered walkway leading to the pool area. 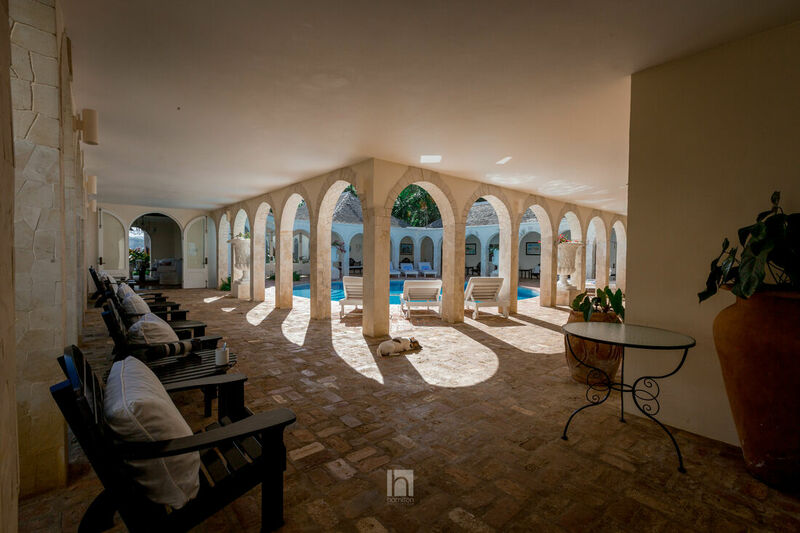 The elegant circular swimming pool surrounded by Palladian arches is a focal point of the house and was inspired by the Emperor Hadrian’s villa at Tivoli. 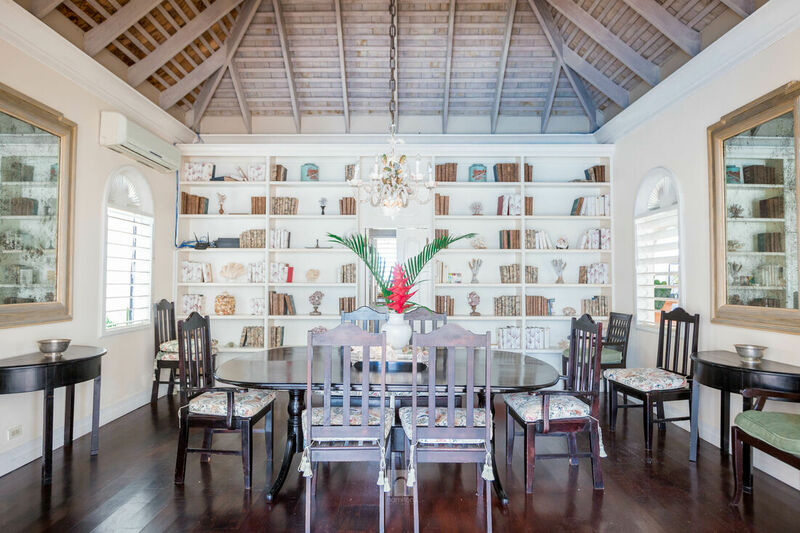 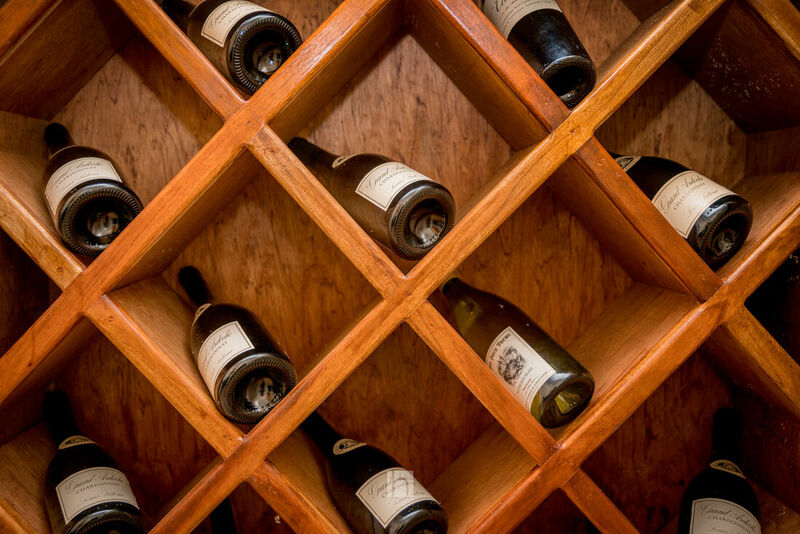 On the west side of the pool area is the dining room (17ft x 17ft) which has four wooden louvered windows, large double doors opening to the pool and access to the pantry and kitchen. 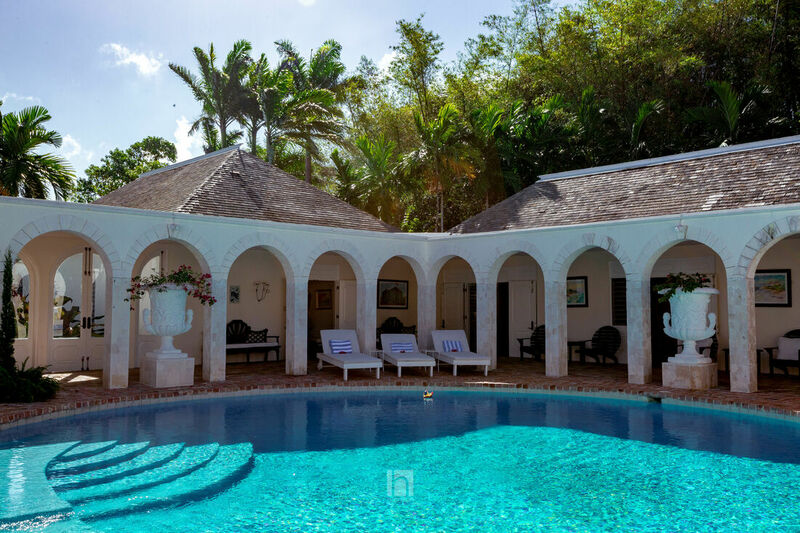 On the eastern side of the pool area is the octagonal living room, each of the eight sides being 12ft 8ins and five of the sides having tall arched French windows. 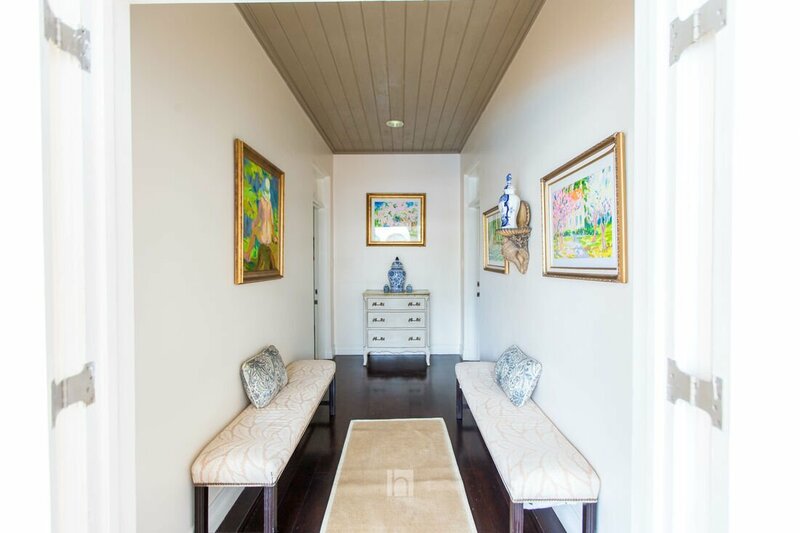 Also on the west side of the pool area is the master bedroom suite with an entry foyer, a large bedroom (28ft x 19ft) and two dressing rooms and bathrooms en suite. 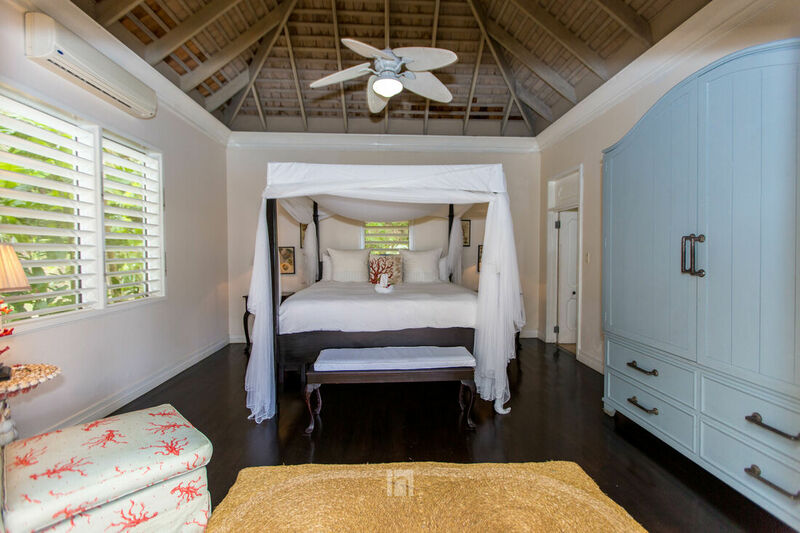 There is a private verandah off the master bedroom and a path leads from the verandah to a private outdoor patio overlooking the Great River. 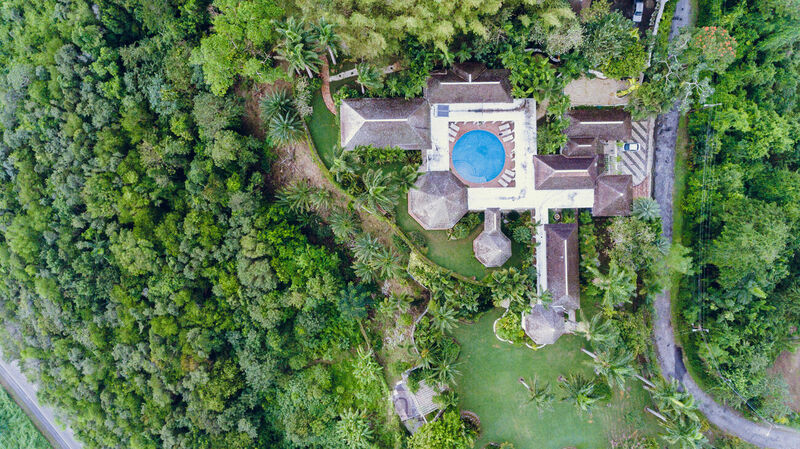 On the south side of the pool area there are two guest bedrooms (16ft x 16ft) and a children’s bunk room all with bathrooms en suite. 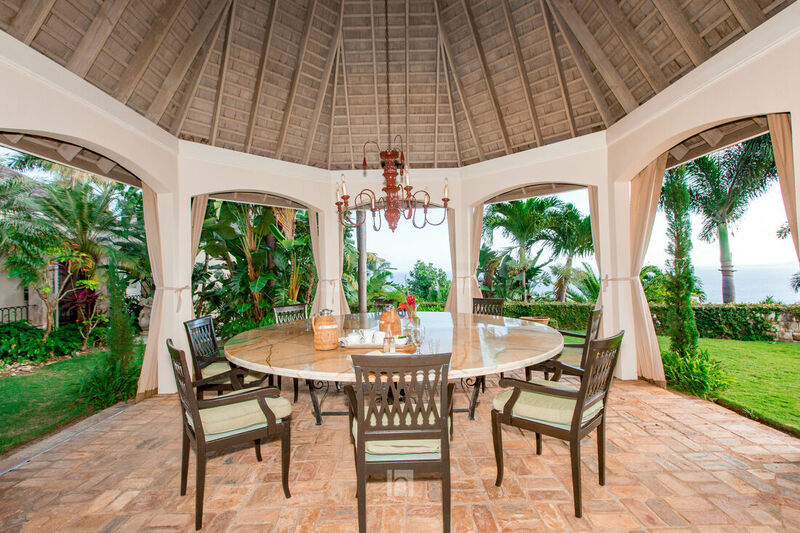 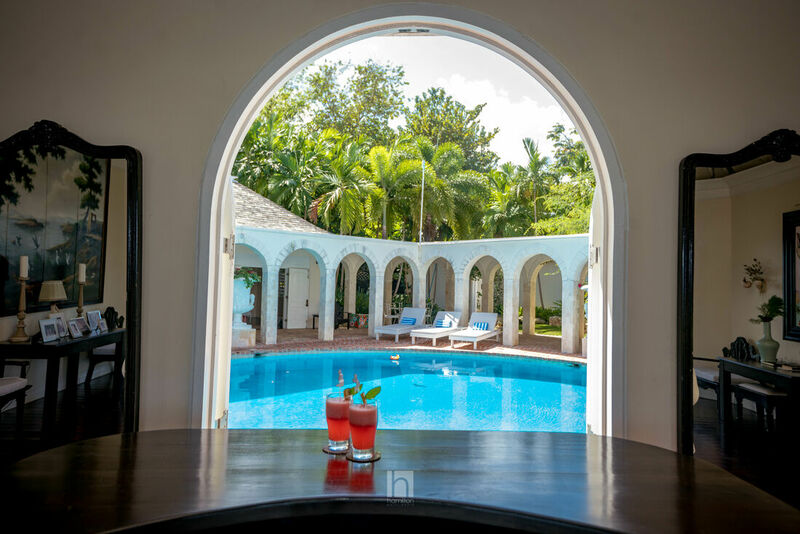 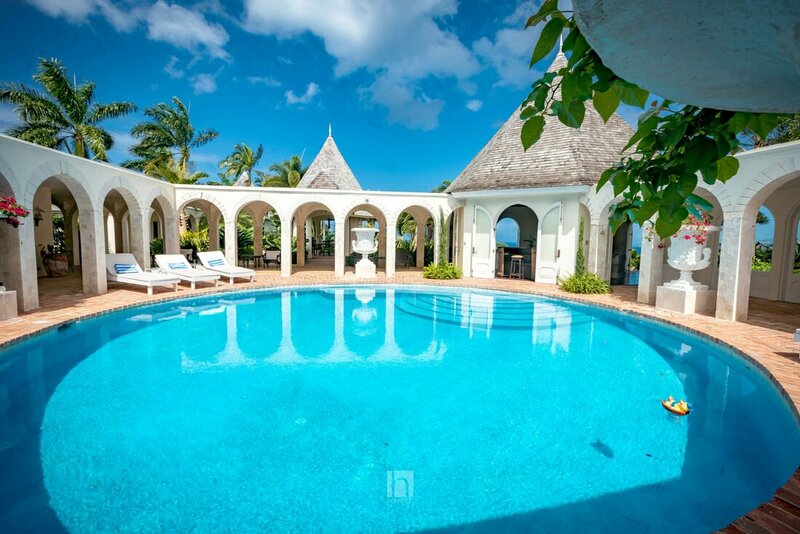 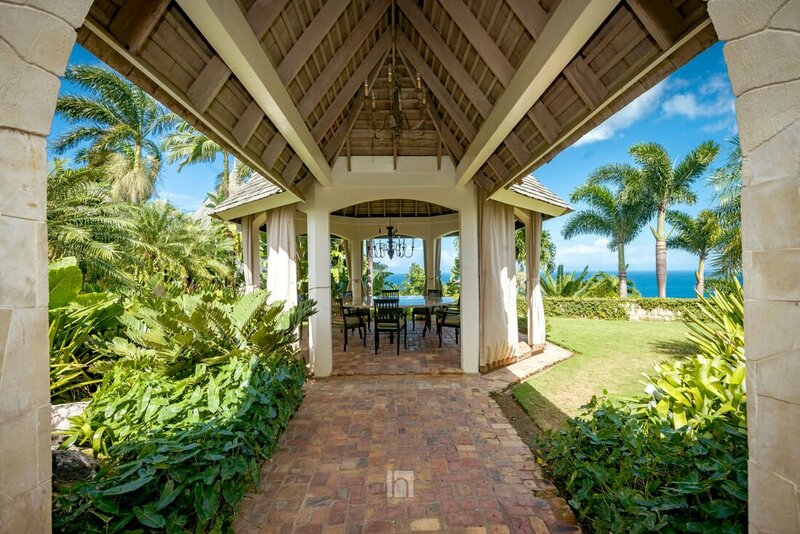 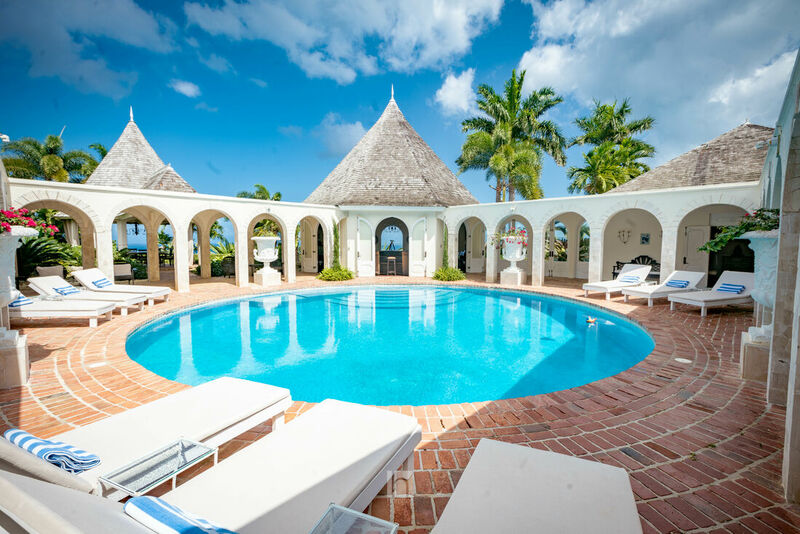 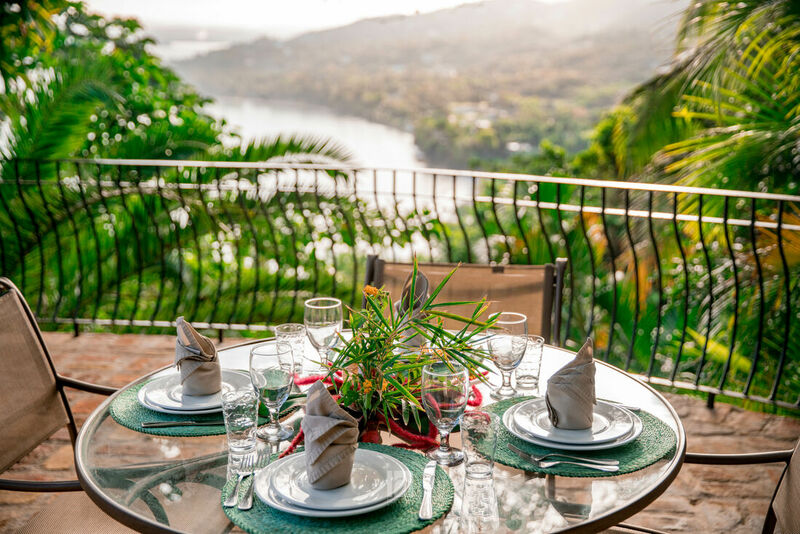 On the north side of the pool area there is an octagonal outside dining pavilion, each of the eight sides being 7ft 6ins with great views of the Caribbean Sea and the tropical gardens. 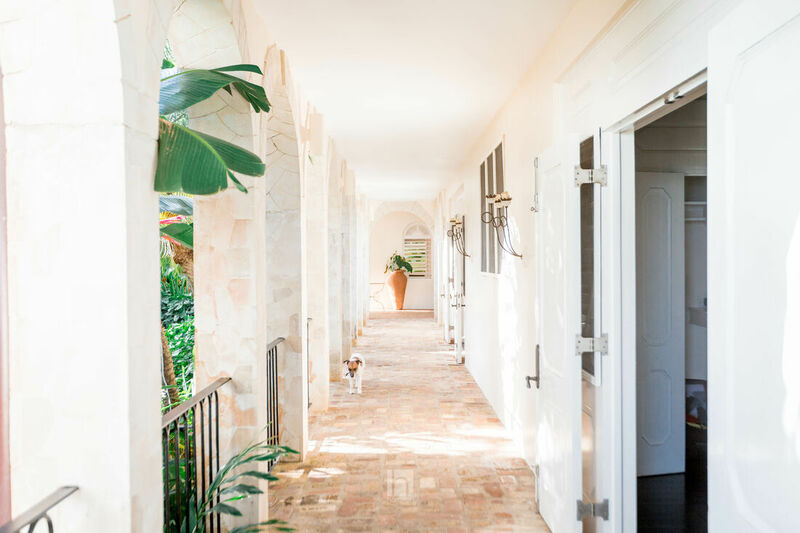 On the north side of the house a covered walkway leads to another bedroom wing containing two more guest bedrooms (16ft x 16ft) with bathrooms en suite. 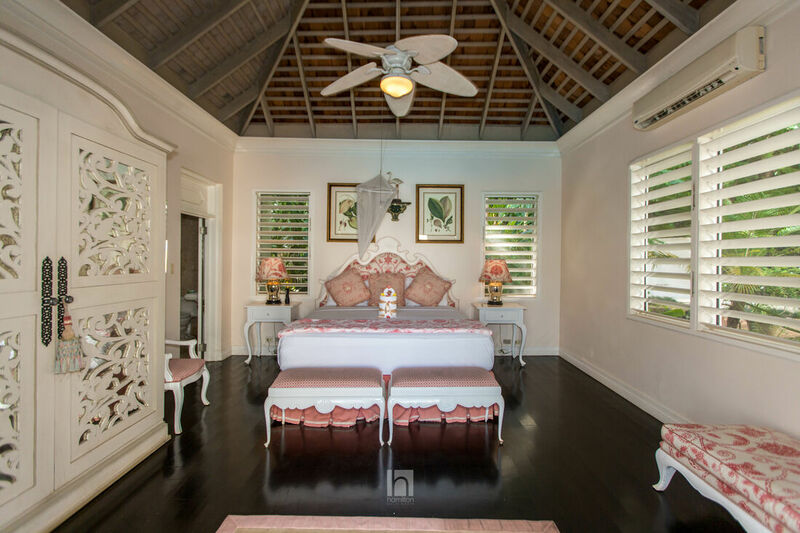 At the end of this bedroom wing there is a very attractive octagonal family room, each of the eight sides being 8ft 3ins which mimics the living room in design and has six large arched French windows. 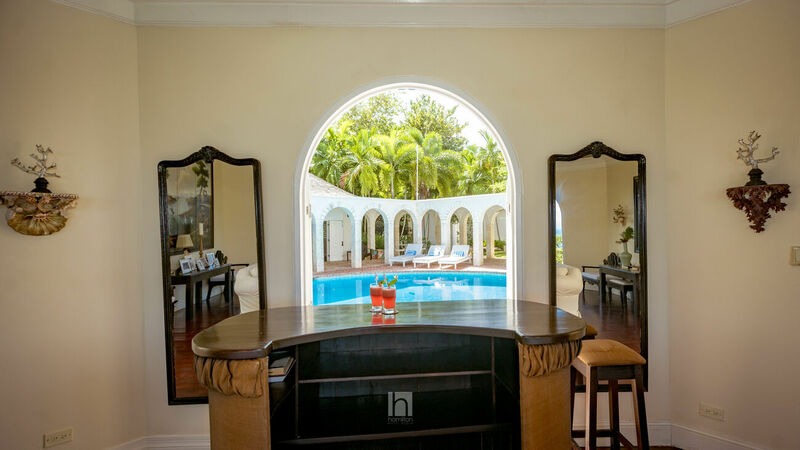 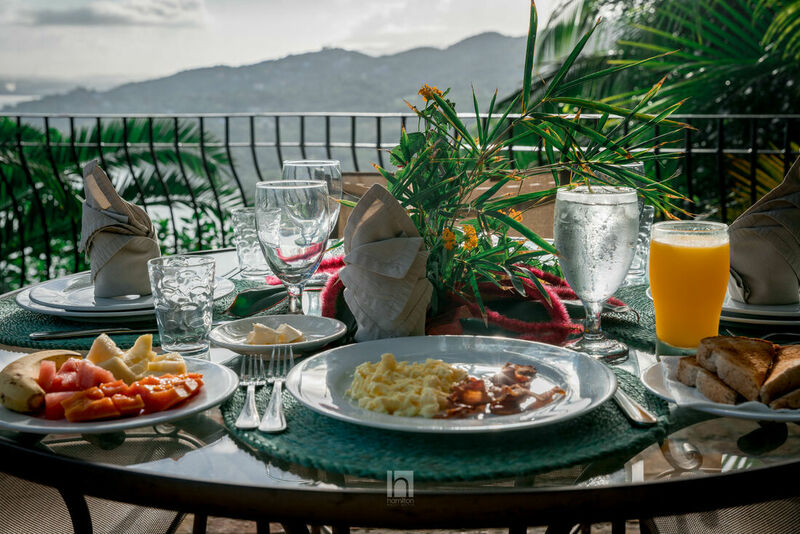 The family room has a full fitted bar and a 180 degree view of the Caribbean Sea from Montego Bay in the east to Round Hill in the west. 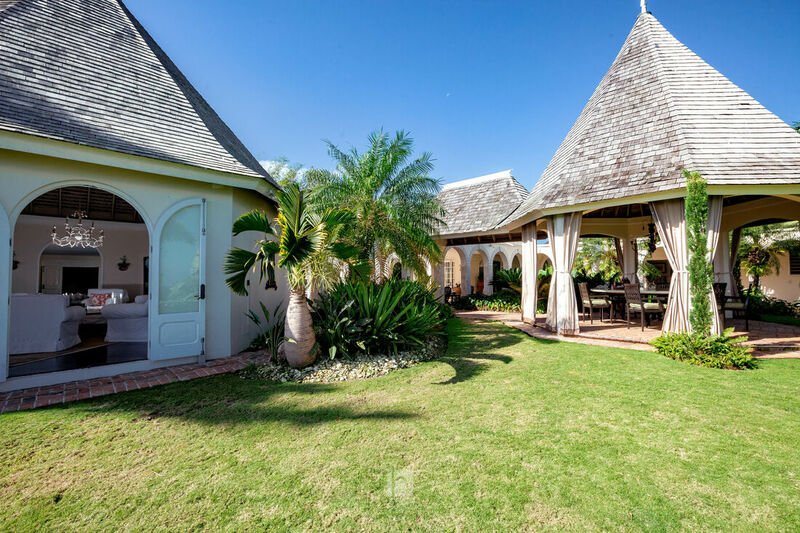 In the kitchen and staff wing on the south side of the house there is the kitchen, two pantries, staff terrace, two staff bedrooms, staff bathroom, staff kitchen and laundry. 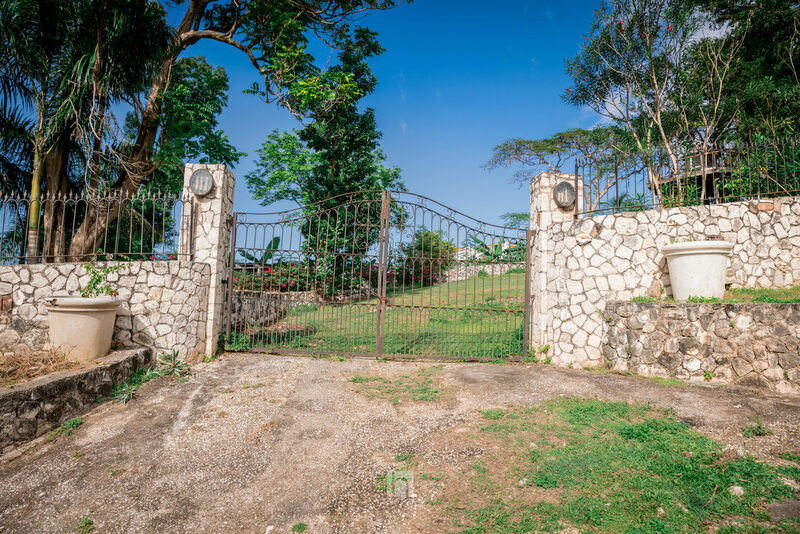 On the south side of the staff quarters there is a small house for the gardener, a full house generator and an electronic wrought iron gate on the back drive. 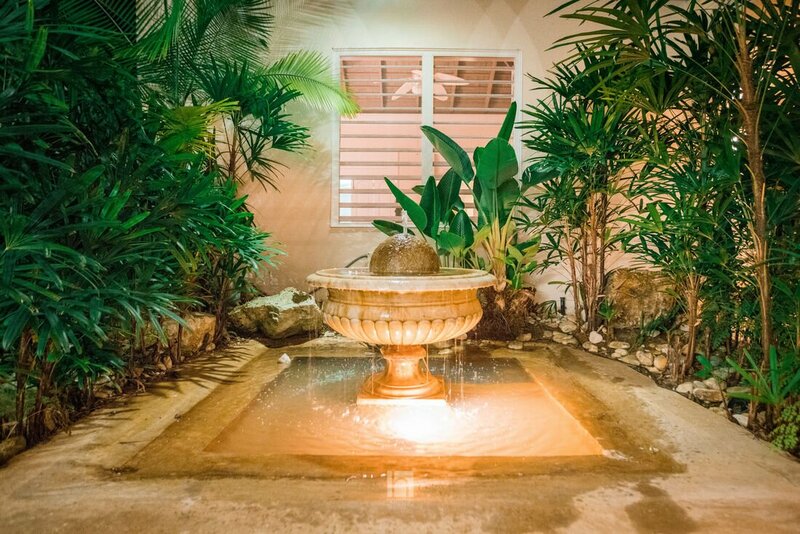 All bedrooms are air conditioned, have ceiling fans and private bathrooms. 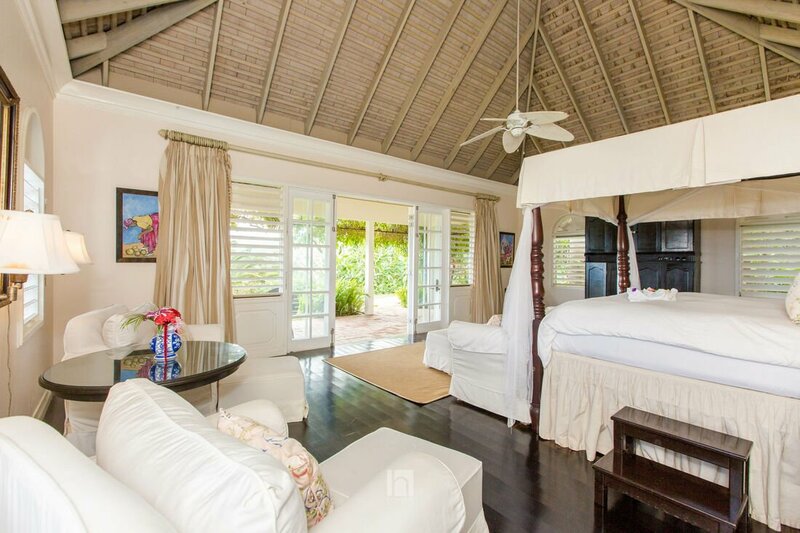 -Master Bedroom Suite - 4 poster king bedroom (28 x 19 ft) with an entry foyer and two dressing rooms and two bathrooms en suite. 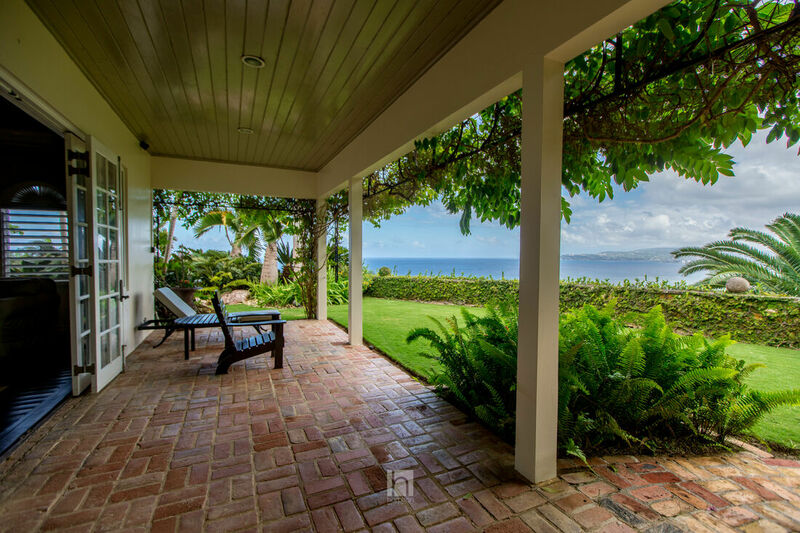 There is a private verandah off the master and a path leads to a private outdoor patio overlooking the Great River. 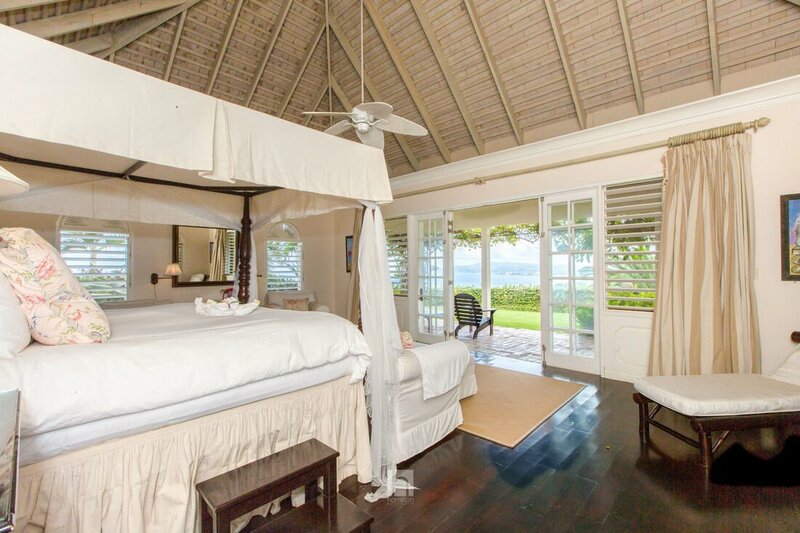 The master bedroom has a 32 inch flat screen cable TV. 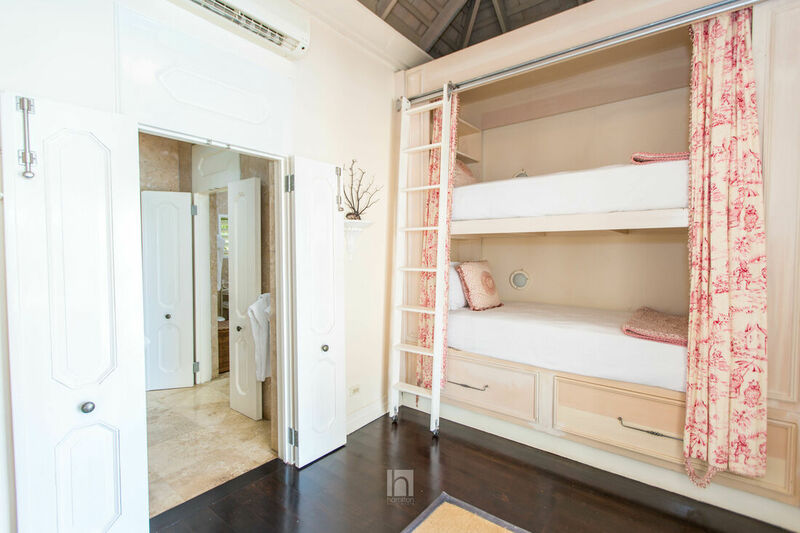 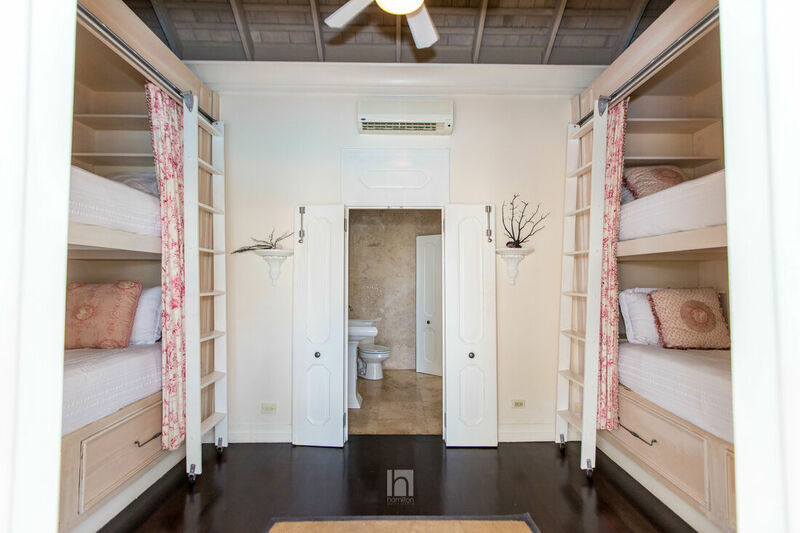 -Bedroom 3 - Children's Room has two bunk beds (4 beds) and private bathroom. 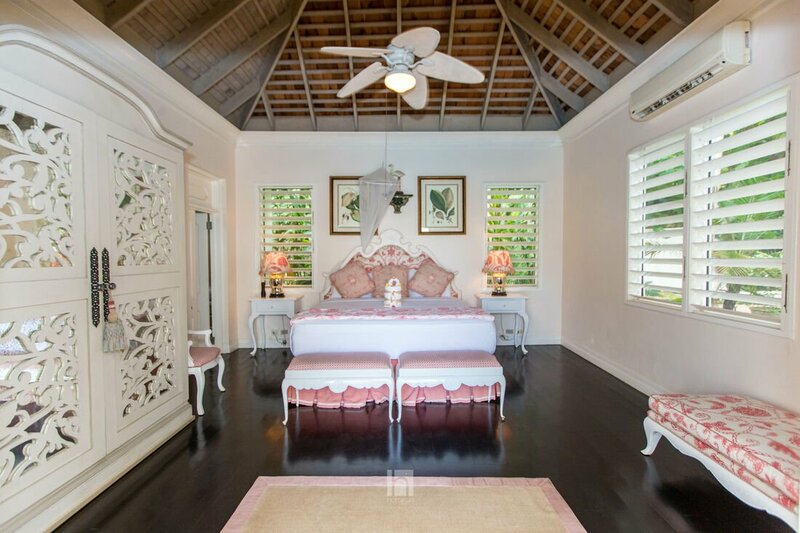 Cottage room: - really best for a spa/ massage room. 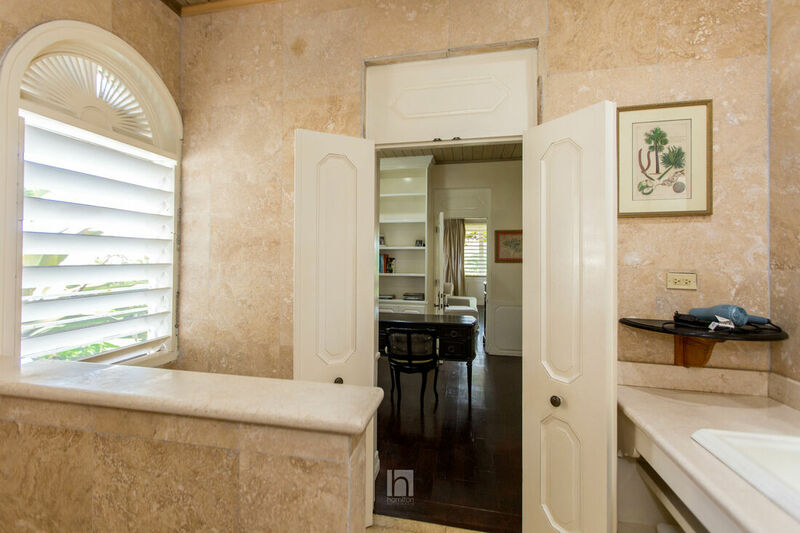 This cottage is about 100 ft. away from the main living areas. 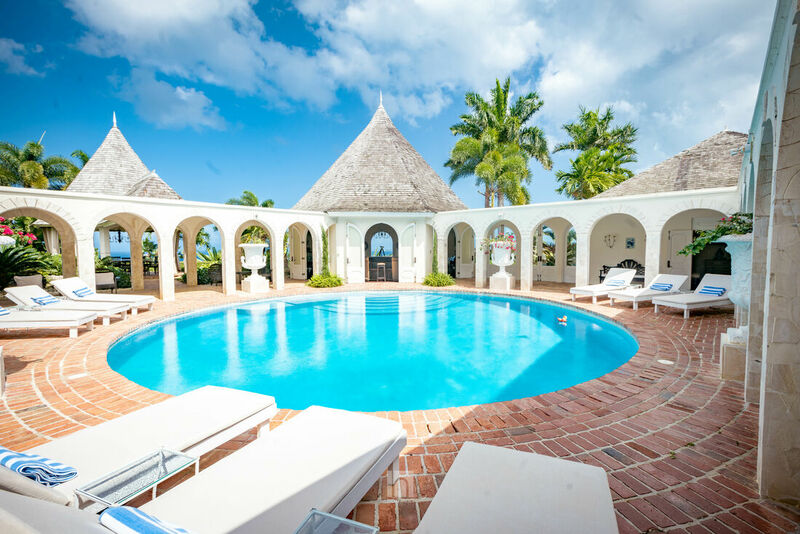 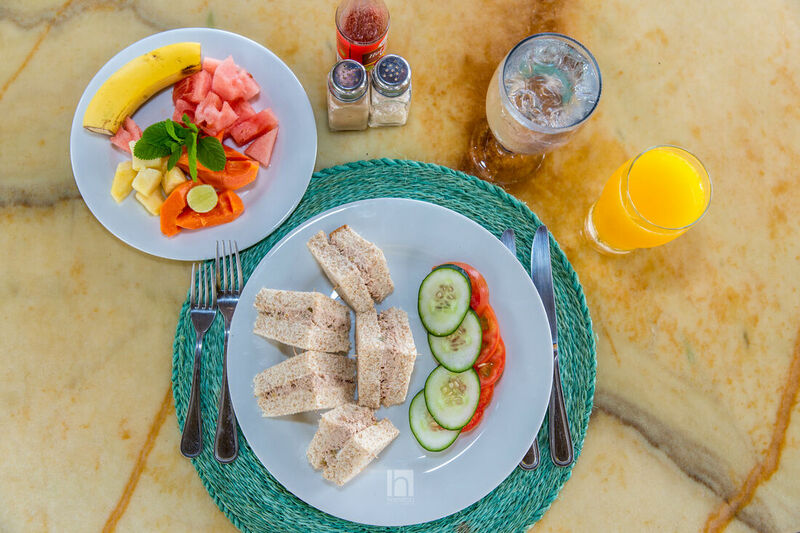 The villa has a full membership at the nearby Tryall Resort including beach, world class golf, fitness center, tennis, Kids Klub and dining. 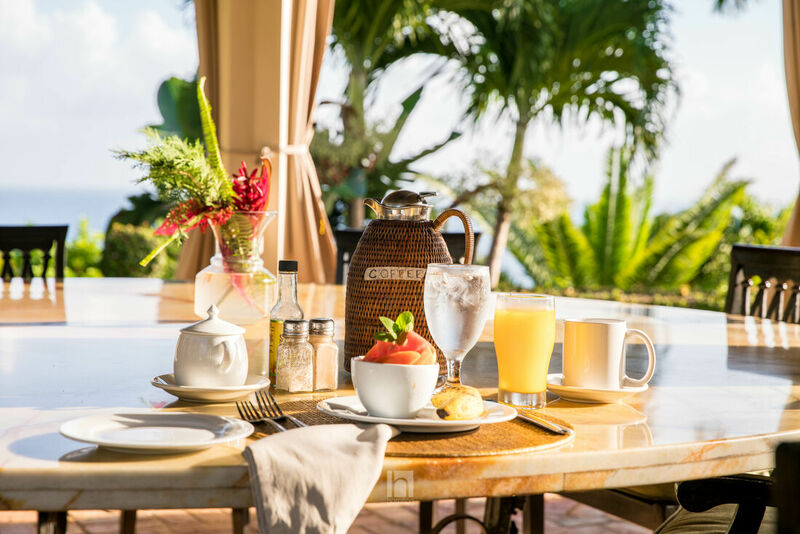 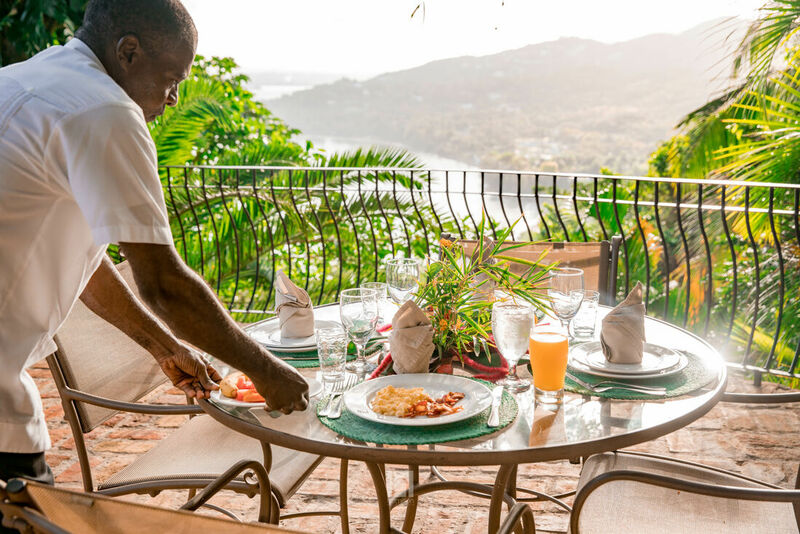 The nearby Round Hill Resort is available for dining, drinks or the spa. 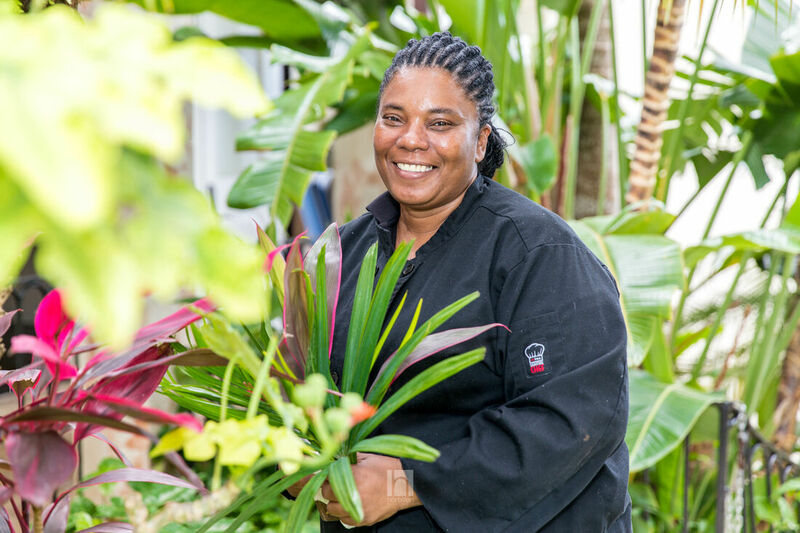 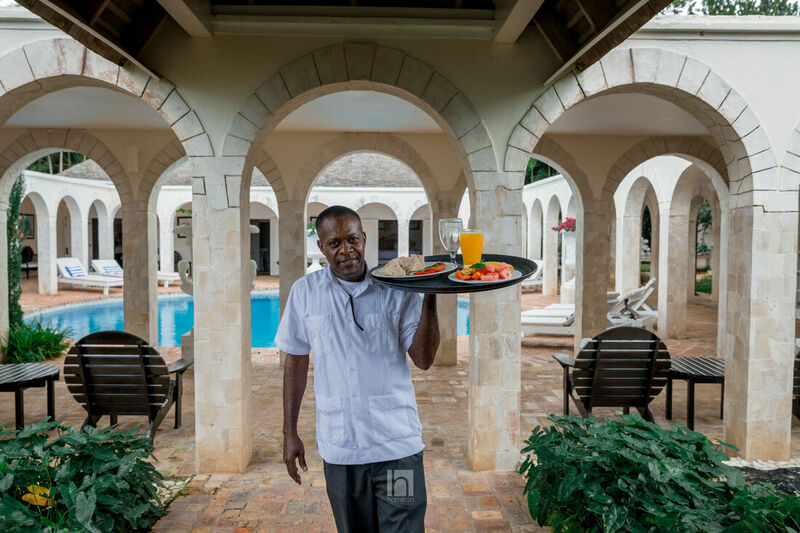 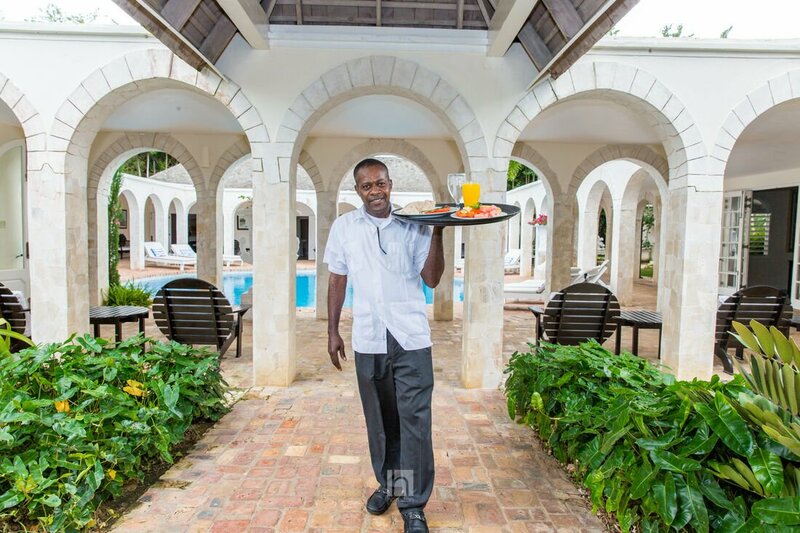 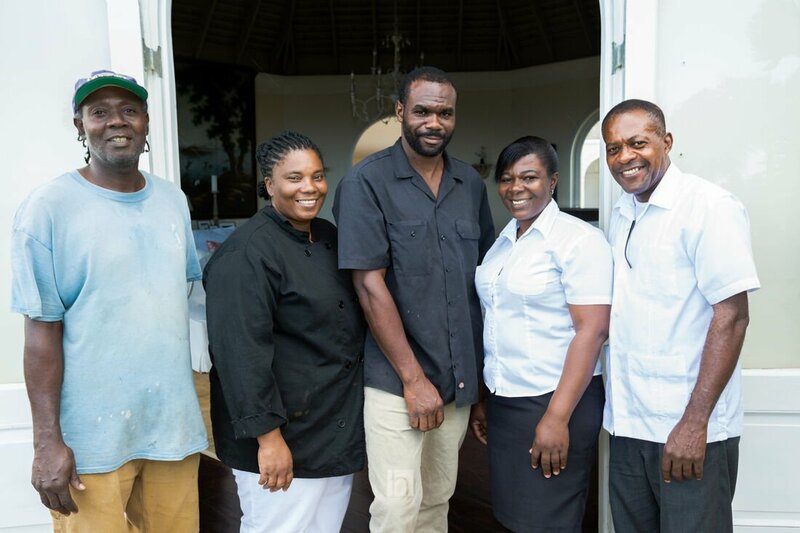 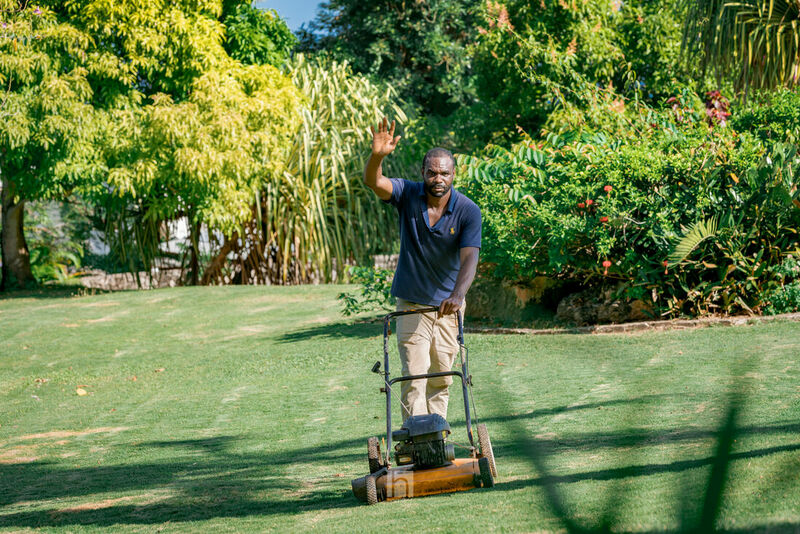 The villa is fully staffed with Chef, Butler, two housekeepers, night manager and gardeners. 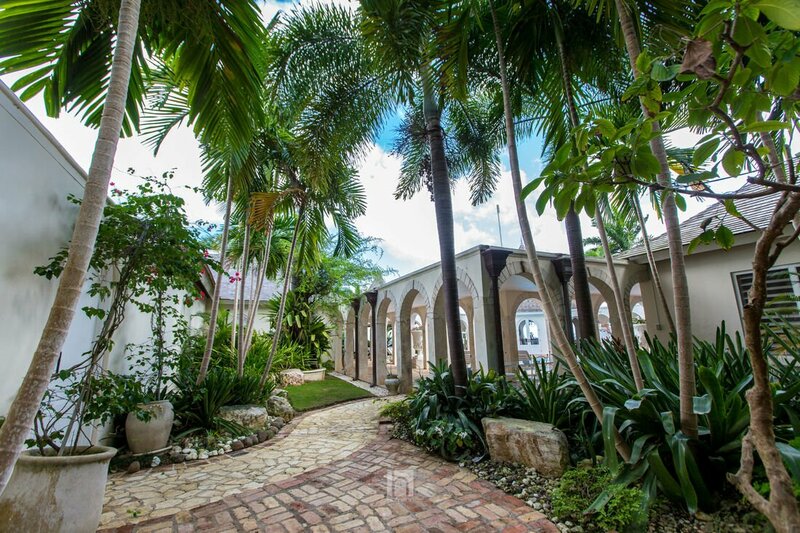 Bambu is the perfect wedding venue! 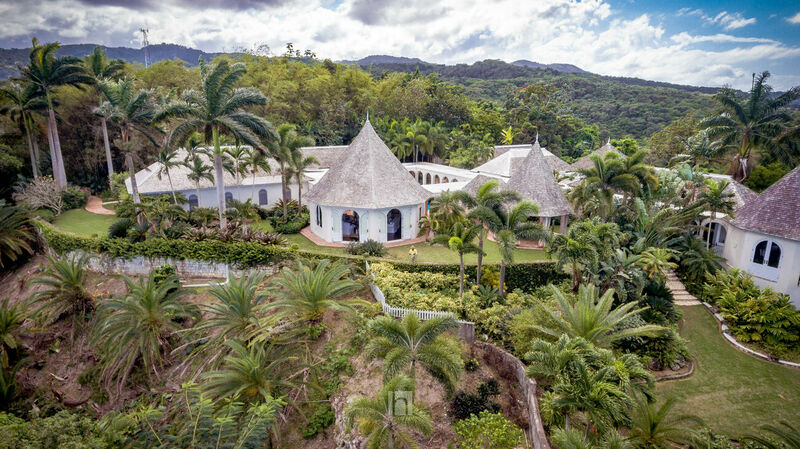 EVENT FEES: Wedding, birthday events etc - where offsite guests come onto the Bambu properyt, attract an additional fee of $25pp, maximum of up to 50pp, security deposit of $2000. 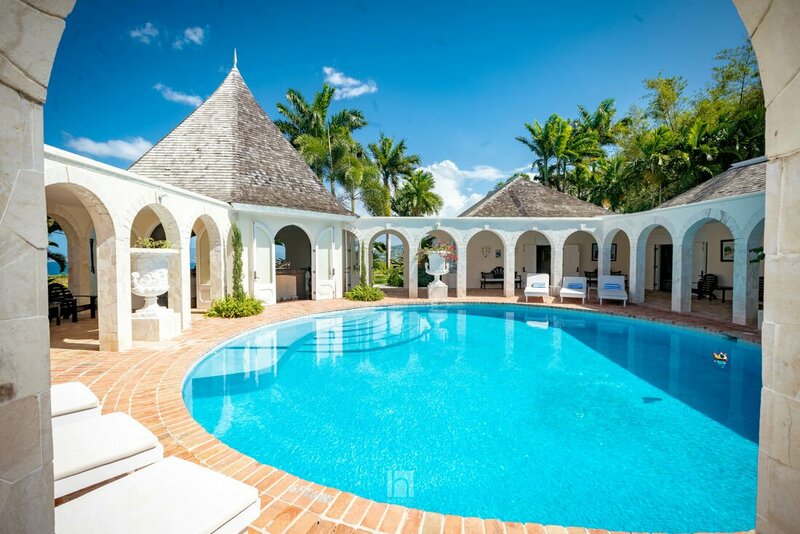 Nicky Fharquarson is the recommended wedding coordinator for this villa. 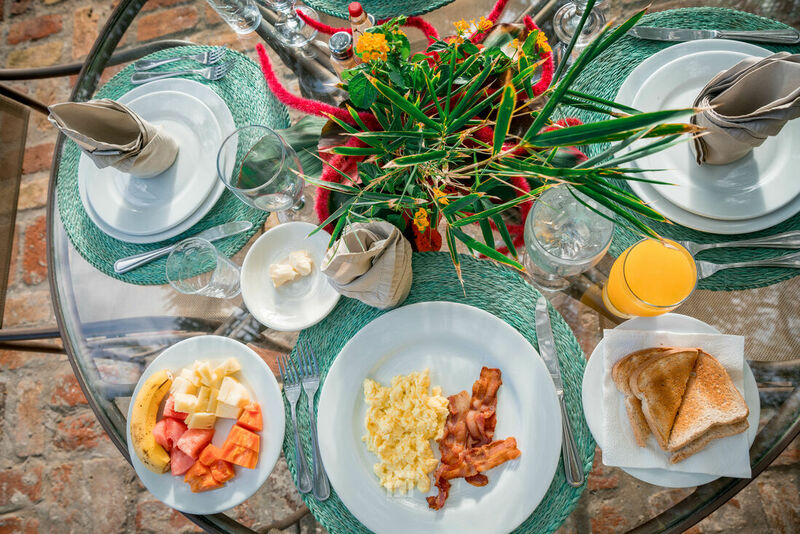 All food must be catered for an event.